...yet another record. In addition to the elevated dorm, several summer camp hypertats had been interconnected with tunnels for winter berthing. 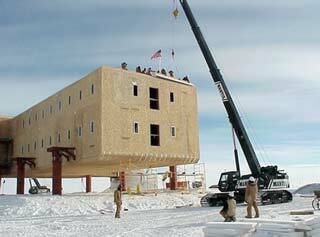 Support contractor changes from ASA to Raytheon Polar Services Co. (RPSC) (1 April). 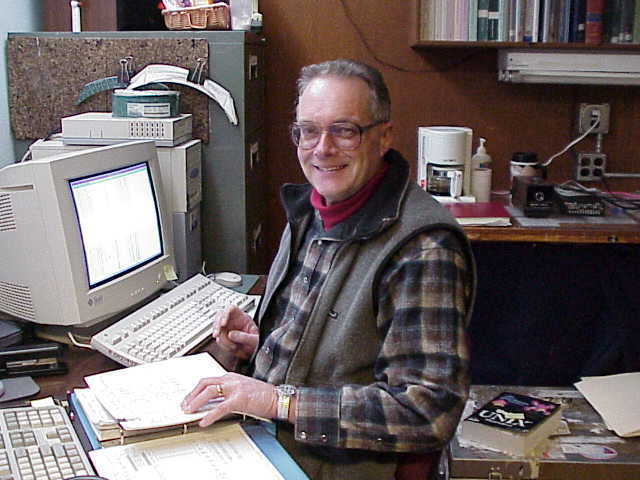 Australian AST/RO astrophysicist Rodney Marks dies suddenly (12 May). 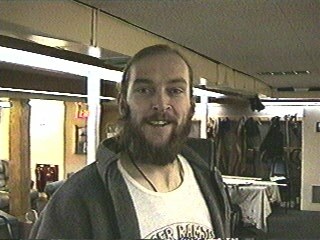 Rodney during his first winter in 1998, as photographed by Robert Schwarz. Rodney continued to share his love of life and astronomy with his fellow Pole residents (and the rest of the world) up until his death. Here's my page with the updated news links, as well as updated links to the CARA and Harvard/ Smithsonian memorial pages. And here is a page of his March 2000 sunset photos. Other winter medical problems include two broken arms and the Doctor's case of sciatica. Power plant construction continues on schedule. 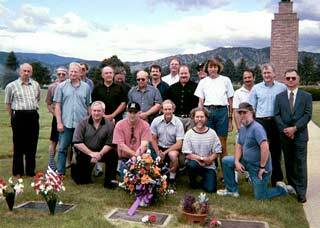 The 1977 winterover Pole Souls hold a reunion in Boulder, CO (17-20 June) with 100% attendance. This was an awesome event...1977 was a good winter, not only at Pole but also at Palmer, as the Palmer wo's had a reunion in Newport, OR in 2006 with 100% attendance of survivors (and guests including me). As far as I know these have been the only two Antarctic winterover reunions with 100% attendance. 20+ years later no less! Multiyear renovation of McMurdo housing facilities continues...in addition to the remodel of Dorm 204 (now 203B), the major project was the complete rebuild of the Building 155 galley food serving and dining areas, getting rid of the old "Enlisted" and "Officer" sides and creating essentially what is there at present. As the area had to be completely gutted, the winterovers ate in the library for much of the winter. 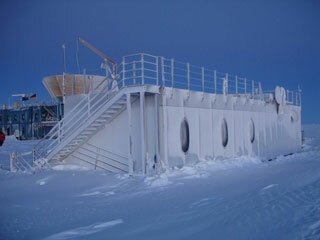 The new "dining facility" opened in mid-August, shortly before Winfly (22 October Antarctic Sun article). 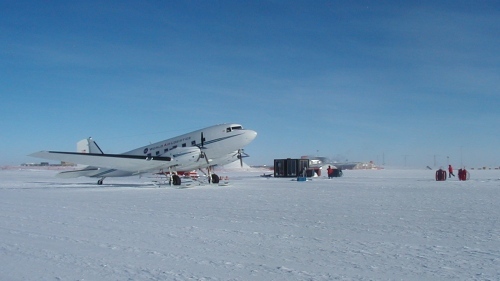 Early season flights include an NSF-chartered Basler twin turbo aircraft, actually a rebuilt and as-new DC-3 transiting from PA to McMurdo. Steel erection for the new elevated structure commences. "SPARCLE Palace" installed at the edge of the Clean Air sector southeast of ARO (12/22) for this one-year University of Washington project. Here's the fresh new building a few days after setting. 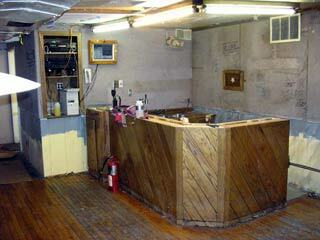 It later was adorned with life rings and other nautical decor as seen on w/o Stephen Hudson's site. 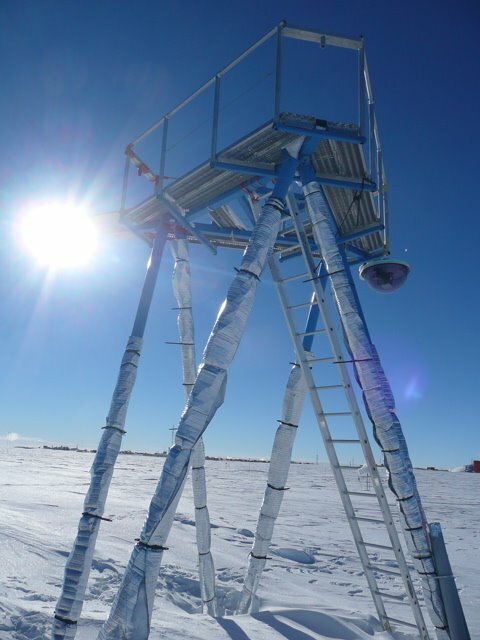 SPARCLE is the "SP Atmospheric Radiation and Cloud LIDAR Experiment--the project studied climatology vs longwave radiation, including "diamond dust" ice crystal formation ("sparcle" as it were). 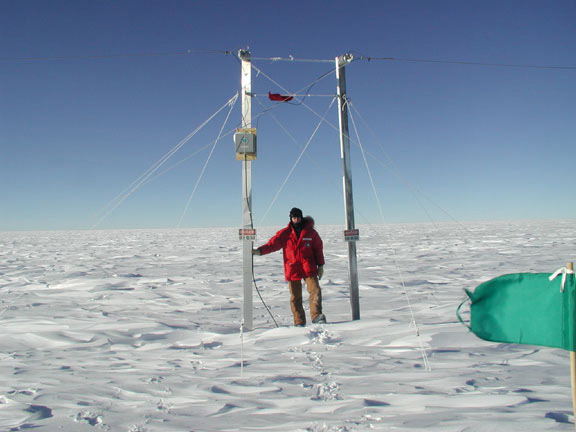 One of the instruments was the SPT--no, not THAT one, but the "South Pole Transmissometer." It sent an infrared beam out 1 km or so and back (reflected) to measure atmospheric clarity. The photo at left is from TEA summer assistant Richard Jones. Here is another of his photos of the place a bit earlier in construction. As with other quality buildings, this one has since been recycled. During the 2007 winter it was adopted as the smoking area, as documented by this common drive photo. Bouldering wall equipment installed in the gym. 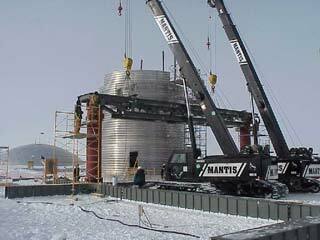 Tunnelers complete the main 2000-foot utilidor system using the CRREL boring rig and some "hard snow" mining (the full story of the ice tunnel project). 9-meter MARISAT/GOES antenna tested successfully (18 January). 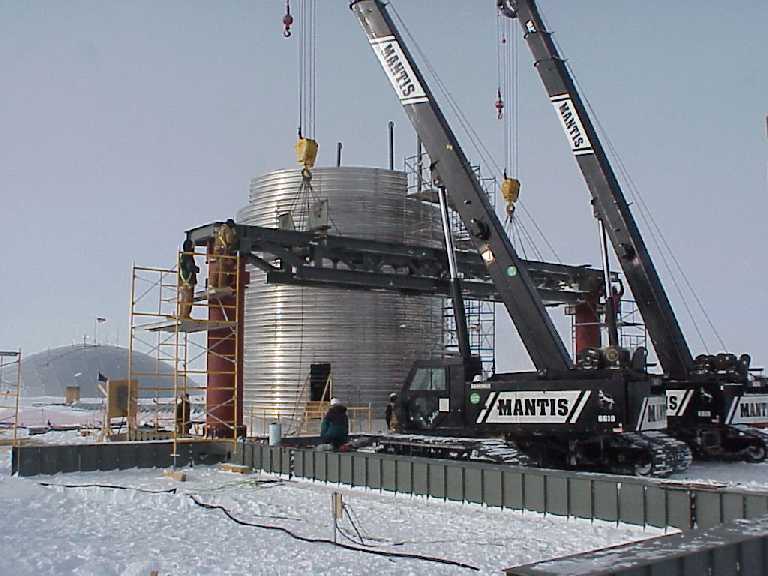 Here is the dish being lifted into place on the antenna platform on the "RF pad" half a mile south of the station, on 20 December. The associated RF building was also erected nearby. Last year COMSAT (subsequently bought by Lockheed Martin) moved their MARISAT F-2, the oldest (1976) INMARSAT satellite, to a new (almost) geosynchronous orbit, visible from Pole, over the Atlantic Ocean. Broadband satellite availability would total more than 15 hours/day when the new link is working according to some reports at the time, but that was not practical. And it would take 2 more years before the system achieved its design objectives (more information and photos). Dark Sector Lab completion deferred due to work on the MARISAT facilities. 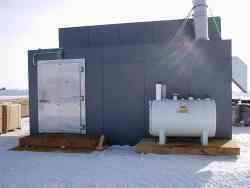 Significant rebuilding of cryo barn to house 3 1000-gallon Wessington liquid helium dewars. New power plant goes online (20 January). 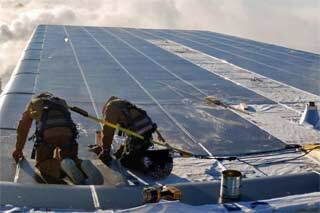 Final insulated panel installed on new station (24 January). Installation of the final panel is marked by the American flag...this is the south end of wing A1 which now houses winter berthing for 50 folks. (NSF photo by John Rand) (Antarctic Sun, 1/28/01) Steven McLachlan has an excellent series of summer construction photos thanks to Scott Smith, Neil Conant and Jerry Marty. Feeders from the new power plant to the new garage and the elevated station (construction power) completed and energized--this reduced the load on the old power plant switchgear to below its 450KW limit so that parallel operation of the emergency (summer camp) plant was no longer required. ...along with a bit of science. Foucault pendulum experiments had previously been conducted in the dome, but the newly erected incomplete vertical stair tower for the new elevated station provided a much better test setting--the pendulum could be more than 100 feet long. The intrepid science team seen here consisted of (from left) SPARCLE scientist Mike Town, LIDAR researcher John Bird, and cryo tech Al Baker...the results verified that the Earth does in fact rotate around the Polies, despite what could be determined by flushing a toilet. Here's their documentation. 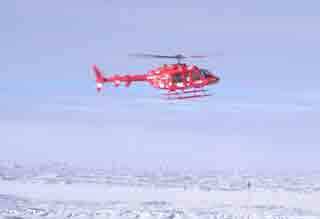 Twin Otter arrives from Rothera on historic winter medevac mission (25 April) to rescue Dr. Ron Shemenski, who had been diagnosed with pancreatitis after gall stone problems. 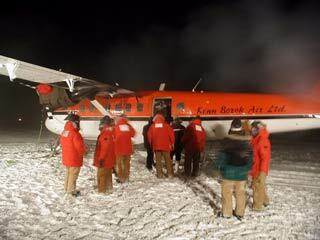 Pole residents greet the arriving flight, chartered from Kenn Borek Air of Calgary. 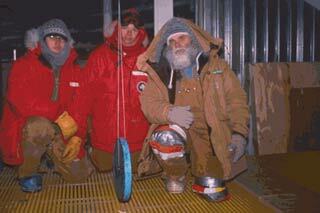 On-deck temperature was -92°F (-69°C). In addition to the replacement doctor and previous w/o Betty Carlisle, the aircraft carried over 100 lbs of salt, which had already run out. The full story and photo credit is here. The Pole medevac wasn't the only one happening. There was one going on for McMurdo as well, four four people requiring medical attention (one of whom was a firefighter who'd suffered a concussion in a fall). They were flown to Christchurch on a RNZAF C-130 on 24 April (NSF press release). 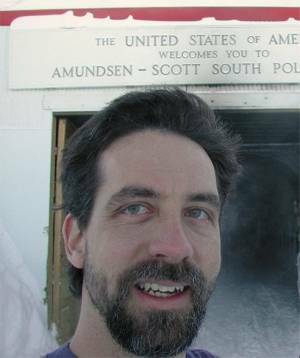 Seven other people also left McMurdo on that flight due to family emergencies or other reasons. Extensive troubleshooting gets the MARISAT data link back on line. Piping completed in new outfall utilidor. News of 9/11 disaster causes shock, concern and mourning at Pole. 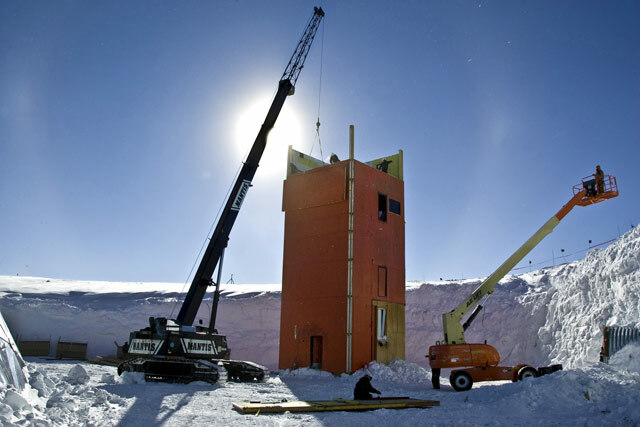 Construction begins on new SPRESSO seismic vault. Tunnel crew shows up to complete year 3 of 3 of the ice tunnel project. This aerial view looking south shows the foundation beams for the next phase of elevated station construction. Between the station arches and summer camp is a large temporary excavation dug for access to the new utility tunnel by the CRREL tunneling machine. In the south wall of this trench a parachute dated 1952 was discovered (my souvenir piece of it); presumably this was left over from the early station airdrops which were the main means of supply to Pole until the arrival of the LC-130's and their fuselage tanks in the early 1960's (more information on the ice tunnel project) (photo and parachute piece courtesy of Jerry Marty and Steven McLachlan). Successful gremlin hunt conducted in the new and old power plants after a series of outages and control problems which started during the winter. The first columns for the next pod of the new station were erected on 17 November; this photo was taken around the 6th of December when all the columns had been erected. Note the large downwind snow ramp, not a snowdrift but an access for material delivery. 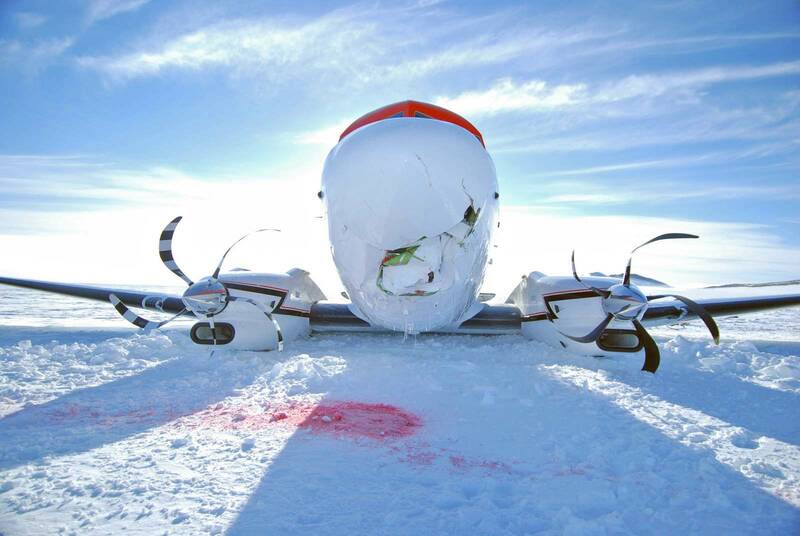 This would later cause differential settlement problems) photo from Jerry Marty and Steven McLachlan). Here is more information and photos. Time capsule installed in the new station grade beams, to be opened in 2050 (11 January). It would later develop that this wouldn't be the only time capsule to be placed in the new elevated station, but this would not be known until...later. 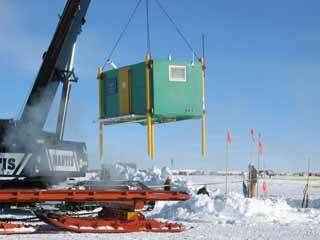 The capsule itself was in a wooden box, and it was accompanied by other items. 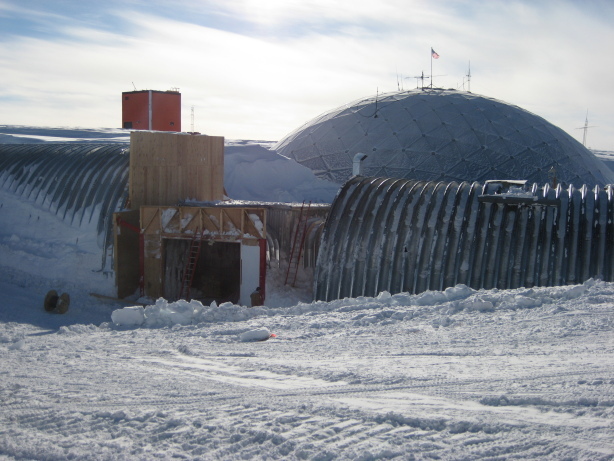 Placement was witnessed by Karl Erb (NSF polar programs director), visiting members of the House Appropriations Committee, and of course a group of Polies (details/photos). Cosray platform raised 10 feet. The platform was designed for raising and had been raised at least once before, by removing the detectors and platform and adding leg extensions. 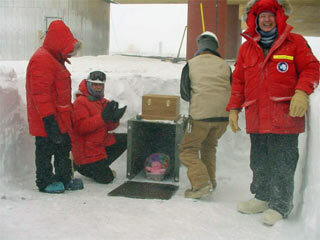 This project was later shut down when Skylab went cold after the 2005 winter; it was reactivated in 2009-10, and these smiley-faced red boxes and their platform were relocated in front of the station (Jack Corbin, NSF). Russian single-engined Antonov-3 aircraft arrives from PH (1/8) crammed with 14 aboard, including Arthur Chilingarov, the deputy Russian Duma chairman. It fails to take off, creating a significant international incident. After the completion of the visit, the aircraft, well, wouldn't start. Eventually the Russian dignitaries were flown back to McM and NZ (with an $80,000 bill to Russia) while the tourists had to pay for an ANI ticket back to PH. This picture courtesy Scott Smith...his complete story is here, while Steven McLachlan has many more pictures on his site. First formal outdoor "South Pole Marathon" conducted by ANI ends with 5 marathon and half-marathon finishers, and more than one controversy (21 January). At left, winner Richard Donovan finishing and being greeted by two of the half-marathon participants. Much of the controversy that swirled around this event has disappeared from the blogosphere---participant Dean Karnazes claimed that rules were changed and snowshoes were borrowed...and there was that question about the supposed $25,000 prize. Of course we've never heard how the promised lawsuits came out, but I do have the story and photos here. Although this was originally billed as the "first annual," it was the only such NGO event actually staged at Pole...the more recent Ice Marathons have been held at Patriot Hills or Union Glacier. Temporary fuel cooling system is installed in power plant. 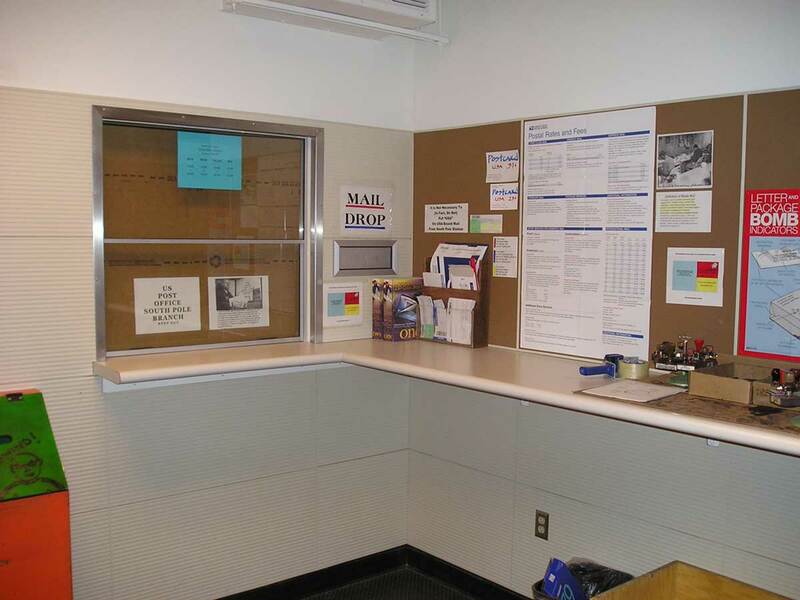 Planned winter 2002 occupancy of the new station berthing and galley is deferred because of cargo delays and settlement problems. New rodwell is placed in service (2/13). This was actually a fairly fast-tracked one-season project--the building was constructed, and the well was drilled to an initial depth of 180' earlier in the season. Meanwhile, underneath this structure, the side tunnel connection and piping systems were constructed and put in service (more info and photos on the building and rodwell). 348 flights were planned this season; more than 50 were cancelled, resulting in a cargo shortage that would delay construction. Also, differential settlement of the buried and elevated portions of the station prevented successful utility connections, particularly between the beer can and the first sections built in 2000-01. It also caused problems with floor, wall, and door installation. At left: the first floor exterior door openings seen as seen from the beer can stairwell--as the building was settling faster than the stairs, the freezer doors (which swing out) could not be installed. After further study, the utility connections would get redesigned, the beer can stairway elevation would be adjusted, and the settlement would be addressed by jacking (more info). Construction continues...NSF delays the official completion date for the new station, in part because Congress approved funding to increase the berthing from 110 to 150. 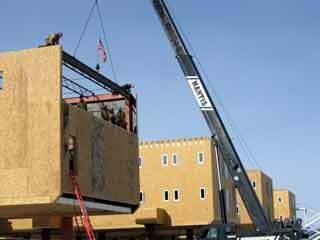 The NMCB-71 signboard is removed from the biomed arch for shipment to Port Hueneme. Here, carpenters Kevin Bjella and George Prehn stand in front of the 4x8 plywood sign in the biomed arch (the rest of the story). Another winter of medical news...this time non-life-threatening, as met guy Dar Gibson has surgery to repair a knee tendon. The operation had help from what has been become known as "telemedicine"--internet assistance from specialists for Dr Timothy Pollard (the guy in the white hat) using the latest batch of electronics that has shown up since Jerri Nielsen's problems (NSF photo by Jon Berry). 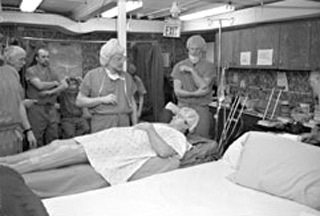 Here is an old scroll photo of Dar recovering in biomed, as well as an NSF press release with more photos. 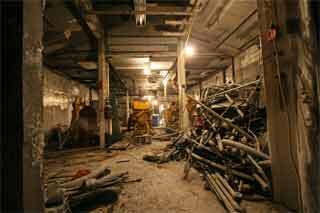 Extensive jacking operations are conducted to level the new elevated station. 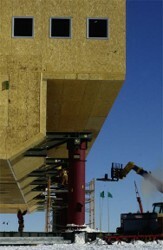 The wood covers have been removed from the columns to expose the jacking points...work is underway in early December. Her caption: Workers at Amundsen-Scott South Pole Station jack up the new station in increments to bring the sections level with each other. The new station is being built to replace the dome, which is being slowly buried by snowdrifts. Photo by Melanie Conner/Antarctic Photo Library. 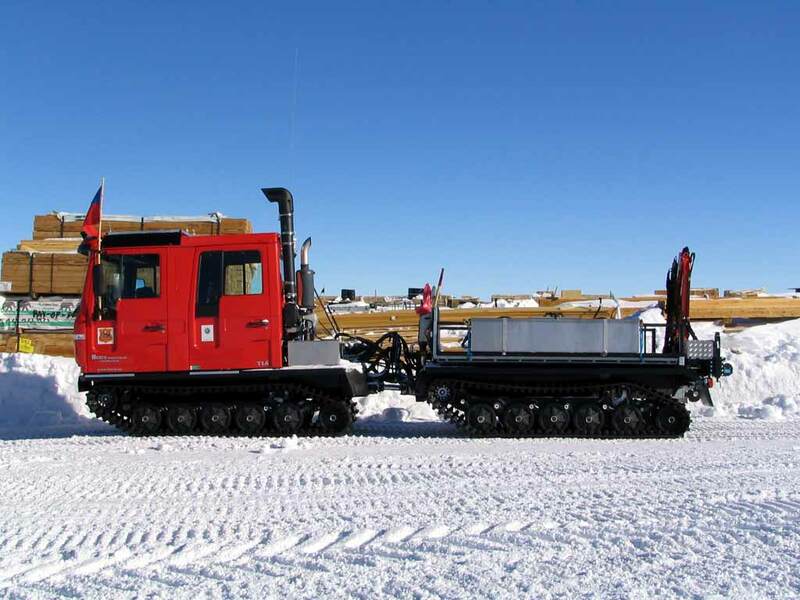 New transport vehicles are delivered--2 Pisten Bully tractors are shipped in (11/18) to support more extensive operations away from the station. One of these German vehicles, more commonly used at ski resorts, here seen on one of those 20km snow stake trips. Pole NOAA veteran Andy Clarke is driving, and ice scientist Joe McConnell is to the right (photo by Eric Muhs). SPMGT upgraded to meet design objectives for MARISAT-F2, GOES, and TDRSS F1 satellite operations (December). The upgrade required replacement of the feed...a fairly easy summer task, as there wasn't any radome yet. One such project--a 5-mile antenna/beacon transmitter aimed at Palmer is constructed for the Stanford VLF research program. 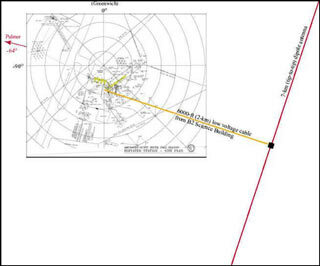 At left, an antenna map from the project website (archived version). It was constructed similarly to the 26-mile dipole at Siple and transmitted on 19.4 kHz. The control building, known as the Inan shack, was west of DSL. Here's an exterior photo of the shack--the original door is behind the drift. Here's an interior view of the transmitters, and here's Dana Hrubes at the center of the antenna. 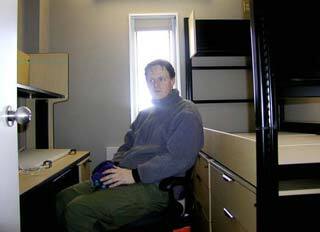 These photos are all by Dana from his 2003-04 winter, more are here and elsewhere on his site. 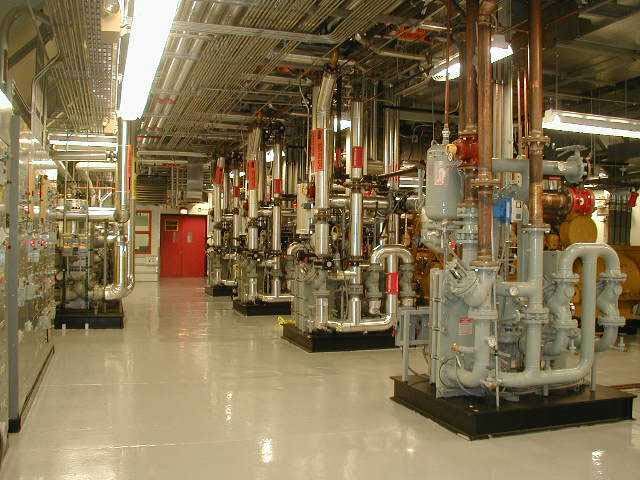 The project was based on Siple technology--some components were saved from Siple before it closed in 1988, and the installation team was directed by Siple veteran Ev Paschal. Operations continued until late winter 2005 when the lead-in fractured, causing transients to damage the power amplifiers. 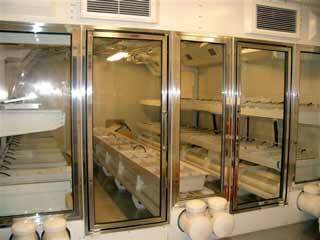 This equipment was shipped to McM for storage/repairs, and reinstalled/reactivated in 2008-09. 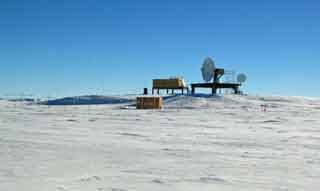 Another remote site--the SPRESSO project--the new seismo vault in the quiet sector. 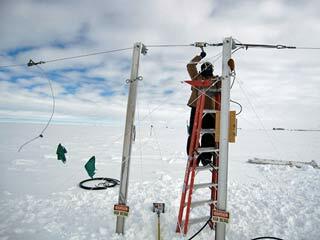 New instruments were installed and are in operation concurrently with the existing ones for one year. Here is a view of the drill camp this second and final season of the construction project. 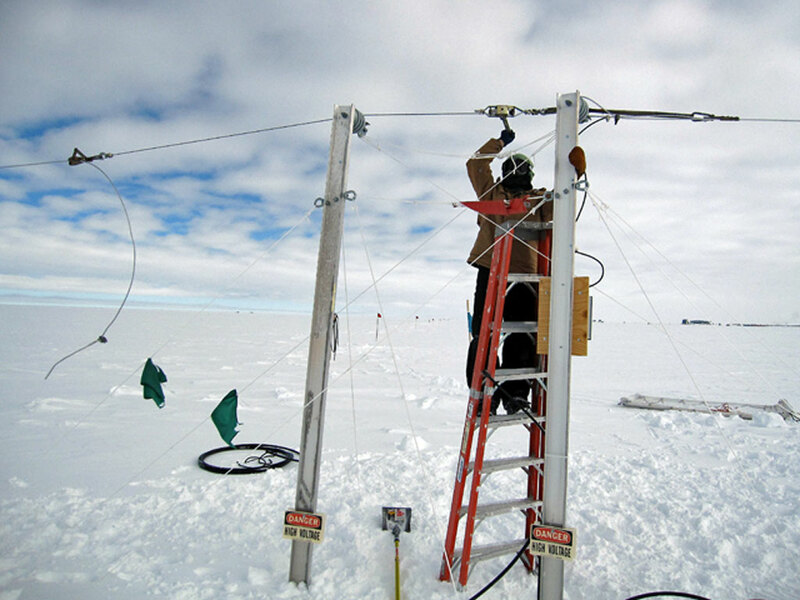 There are 3 985-foot (300m) drill holes in which the seismographs (2 to use plus one spare) are installed. The SPRESSO site is 5 miles south of the station in the "Quiet Sector" formerly known as Pomerantz Land (map). The map is from the VERY LARGE project science SPRESSO pdf page copied from the Pole server. At left next to the cable reel is the control building which would be buried later in the summer. More information/photos/credits. The telescope is on the surface, here you see Paulo Rapex from the University of Rome in front of the ramp to the buried milvan. To avoid interference, the generator and berthing hut is 1/4 mile away. This was a summer-only project. 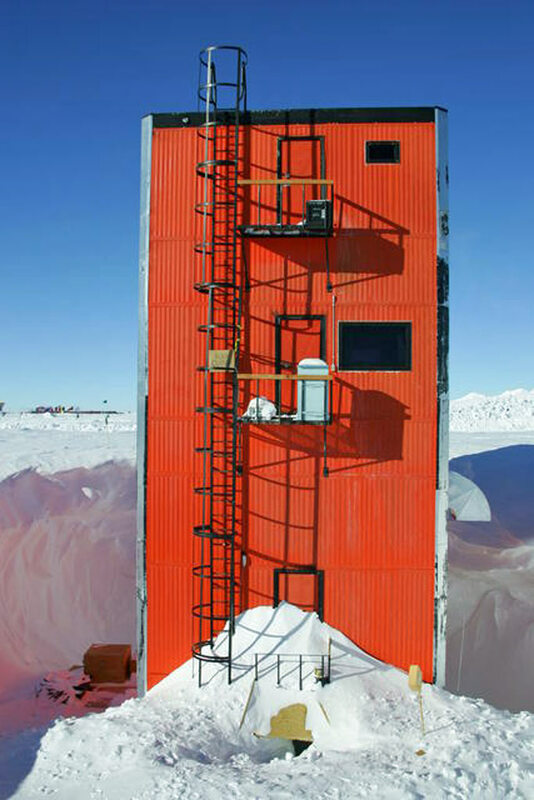 The facade, stairs, and a penthouse were installed on the Dark Sector Lab, the shell of which was erected in 1999-2000 summer. The penthouse was originally intended to house the all-sky camera and other science projects located in Skylab. Plans were for it to be occupied during the 2003-04 summer, but plans were changed again, and science occupancy (by BICEP) did not occur until the 2005-06 summer after the penthouse was removed. (more construction photos are here). The walkway between MAPO and VIPER (the "bowling alley") is enclosed/heated. Occupancy of the new station authorized (3/4), delayed from summer by fire alarm problems. Folks moved in the next day. 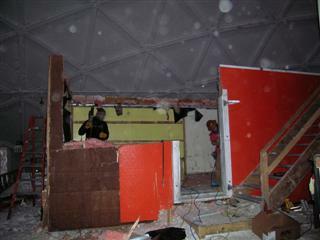 Here's SSL Chris Martin inspecting his winter room in the new station shortly before the end of summer (info/credit). My page of 2002-03 photos in and around the new station is here. Massive work effort to move food and equipment to the new galley, hampered by the broken beer can elevator..."last supper" in the dome galley served on 3/6 with food service in the new galley the next day. Hacker attacks from Romania put the Pole web site and weather watcher behind a firewall for the foreseeable future (3 May). The hackers apparently broke into a computer supporting the University of Colorado meteor radar project, which was installed in January 2002 to study the mesosphere and lower troposphere (NSF project abstract). 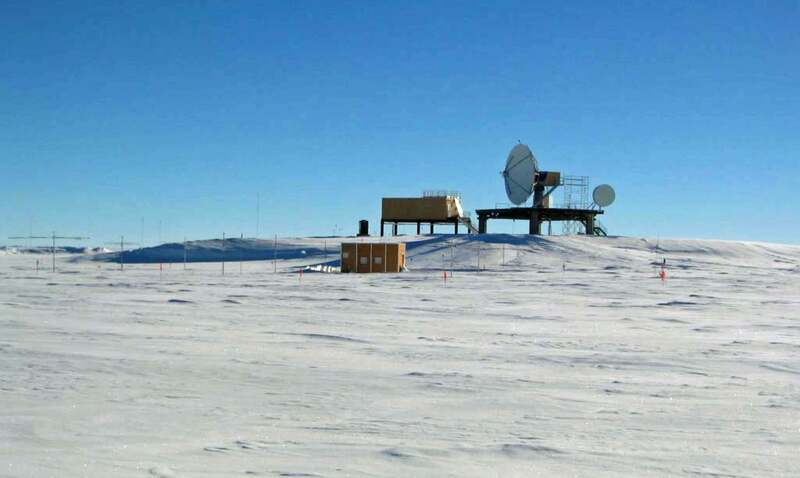 The photo at left (from this 2002-03 SPAWAR electromagnetic environmental survey) looks east from the skiway toward the RF building and the GOES/MARISAT terminal, the meteor radar shack/vault (which was completely buried when I wintered in 2005) is in the foreground. Here is the FBI news report. 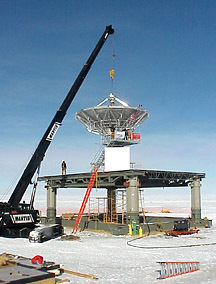 The meteor radar project, most recently operated by PI Scott Palo, ran until mid-December 2011, when it was shut down. Another medevac...environmental guy Barry McCue has gall bladder problems and is flown north. Barry had gall bladder problems which first showed up on 8/25. 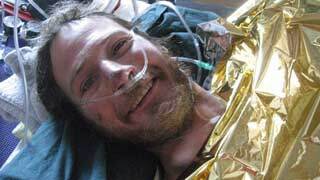 After a second attack 10 days later the decision was made to get him to a hospital. The Twin Otters left Calgary on 9/8 and 9/9, after delays the medevac flight arrived Pole on 9/21 and headed back with Barry after a 12-hour layover. Barry made it to Houston 9/23 where surgery was successful. Because of this issue, NSF gave the 2004 w/o's (including those already at Pole) an additional gall bladder screening (the full medevac story). 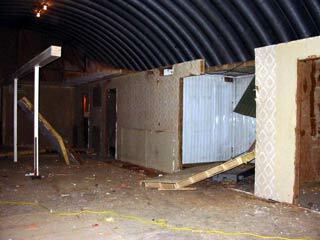 and the freshie shack is demo'd (pictures of the demo and the old galley are here). Fire in summer camp is started by water pump, it is quickly extinguished with no building damage. Partial solar eclipse (88%) occurs on 11/23, the first visible at Pole since January 1990. Power plant phase rotation is reversed (!?). ...and Jennifer Murray's Bell 407 helicopter lands for a visit (and crashes 3 days later). 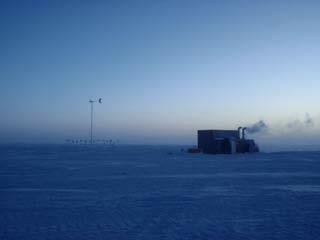 Jennifer and fellow pilot Colin Bodill arrived at Pole on 17 December after spending the night at a fuel cache 300 miles away. Three days later (20 December) they crashed 120 miles north of Patriot Hills. Here are photos and details of this venture. 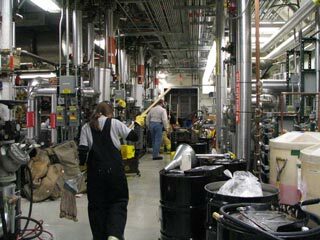 Oil contamination is discovered in the main glycol heating loop (14 December), presumably from a mislabeled 55-gallon drum containing waste oil. The result--a long-term effort to centrifuge the glycol and replace seals and gaskets. SPTR (TDRSS) satellite comms equipment moved from elevated dorm to RF building. 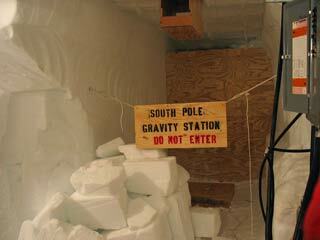 New gravity vault installed in the ice tunnels (January). 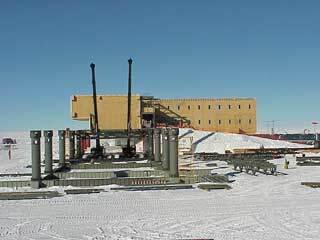 Foundation pad prepared for the "Counting House," the central building for IceCube (this structure is the erstwhile el dorm, to be moved to the dark sector in 2004-05). Meanwhile, the first major component of the IceCube hot water drilling system, this massive reel for the hot drilling water supply, was offloaded and assembled. Here's the "after" picture and more details about what else has been happening. Air intake duct structure completed on upstream end of power plant arch. 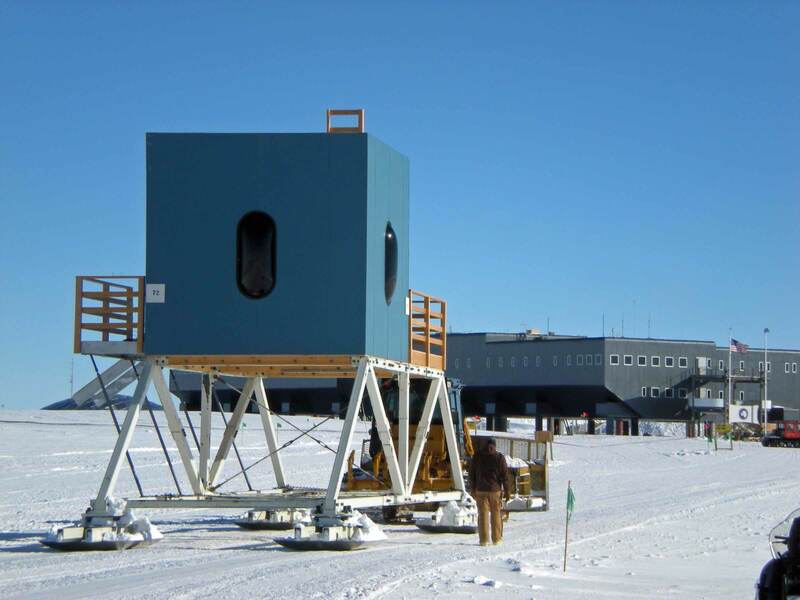 The Automated Astrophysical Site-Testing Observatory (AASTO) was a project operated in the dark sector between 1996-97 and 2003-04 by the University of New South Wales (UNSW). 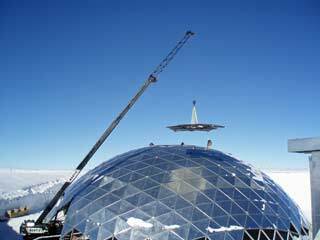 In 2003-04 it was decommissioned, and the shelter and telescope mount were relocated to a site southeast of ARO, for use by the NASA/SETI Institute project that was searching for extrasolar planets (more information, photos, and credits). Successful construction season and a record 329 flights as planned! A3 (medical, computer, laundry, store and greenhouse spaces approved for occupancy (29 January) while B1, B2, and B3 are enclosed. This picture shows the last steel member going up on B3 in early December. This was the first of 2 pods to get enclosed. B3 is primarily comms and admin, while B1 is summer berthing and the "emergency camp" area including the emergency generators which were set this season. All the pages of construction photos start here. Russian mechanics show up at the end of the season to inspect that Antonov aircraft; fluids including 450 gallons of fuel are drained. New sewer outfall (at Rodwell 1) put back in service (9 February) after hot point reaming and other work; the emergency outfall had been used since March 2003. Manager: Pete Koson; population 75 (list and photo)...a new population record! The elevation worm gear on the SPMGT is stripped out at the beginning of the winter, limiting satellite connectivity. Unfortunately there were no spares, so the only solution was to lock the elevation in place and use the azimuth gearing only to access the satellites...which of course limited the satellite visibility. And even if there were spares...there wasn't a radome yet, which would have made maintenance impractical. 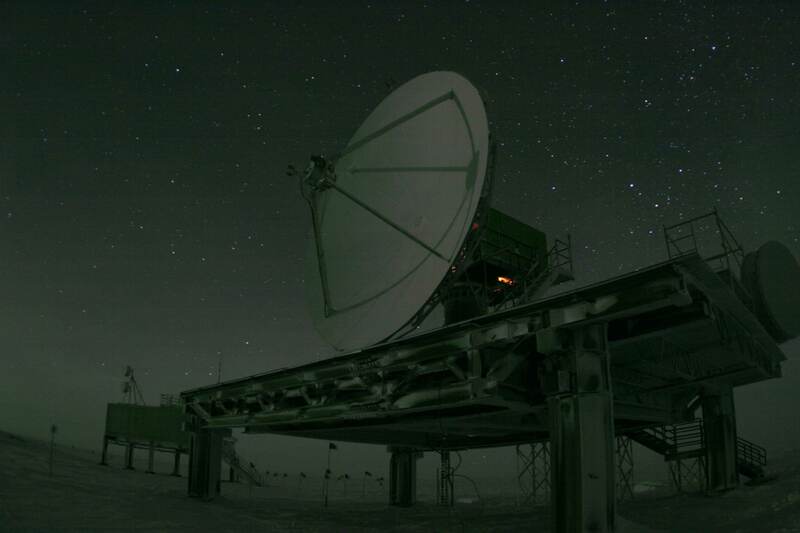 At left is a late June photo of the dish from Glen Kinoshita. 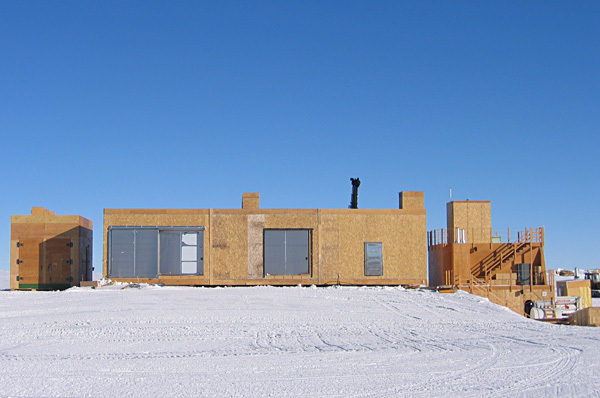 ...perhaps the worst in 30 years, bringing 160+ mph wind gusts and lots of damage to McMurdo and elsewhere nearby, and stranding a Scott Base couple at the A-frame. 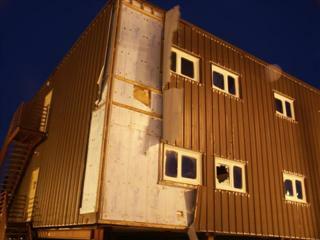 At left, ripped siding and a broken window on Dorm 211. Details and more photos. 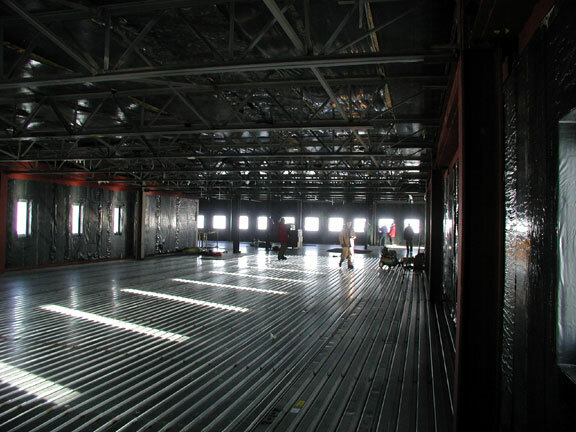 The facility was prefabbed and checked out at the University of Arizona, which had the prime contract for the project. Biologist/engineer Phil Sadler (who first worked at Pole as a construction GFA in the late 70s, and later developed the McM and Pole greenhouse concepts) was a principal designer. I've got more detail, links and references here. 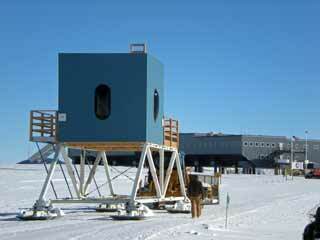 Erstwhile Elevated Dorm towed across the runway to the dark sector. 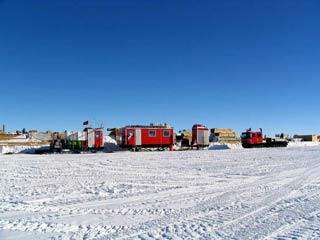 ...as IceCube mobilizes a massive drill camp...and successfully drills one hole. Left, a portion of the drill camp (full sized panorama) as seen from MAPO. 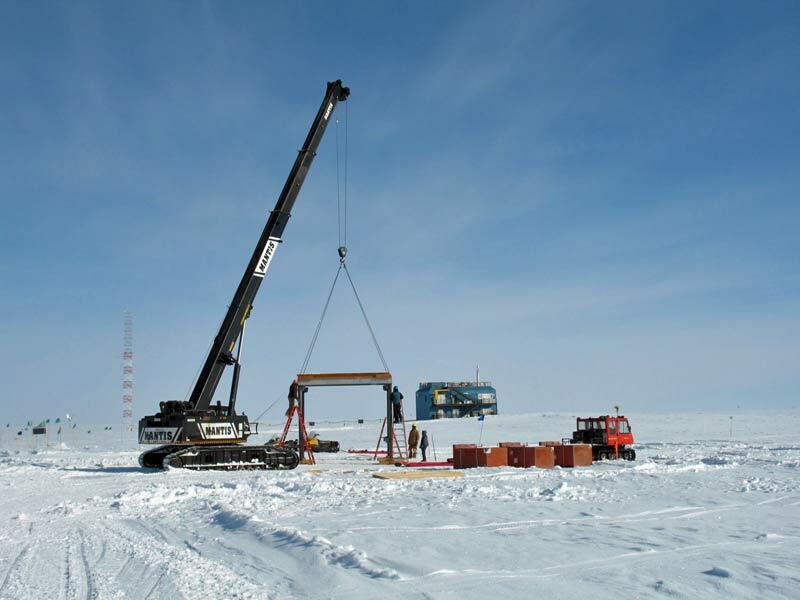 The hole reached a depth of 2517m on 27 January, and the string of 60 optical modules was lowered to a depth of 2450m and officially turned on by Jerry Marty on 29 January. 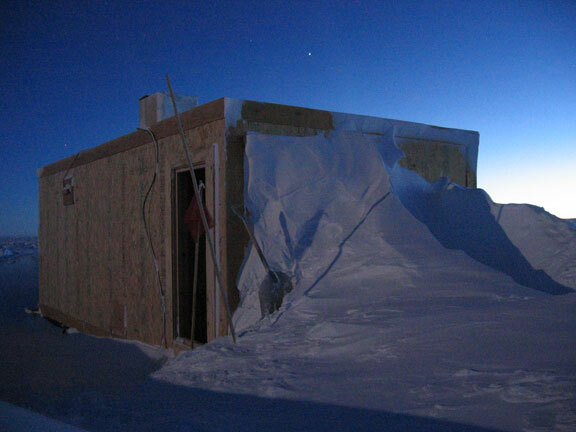 The camp, or "Seasonal Equipment Site" (SES) was then demob'd to the berm for winter, this was completed on 8 February (photo by IceCube team member Brian Pechan). 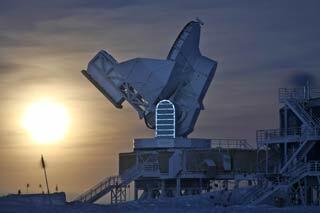 Official groundbreaking held in Dark Sector for 10-meter telescope project. 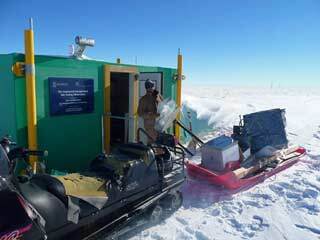 Chilean scientific traverse arrives from Patriot Hills (1 December). 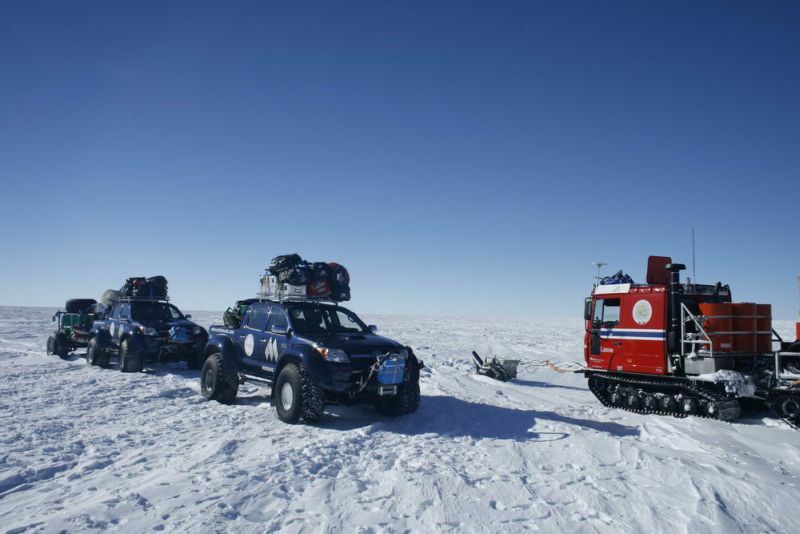 The traverse consisted of 3 sleds (left, seen parked at Pole) towed by a Swedish-made Berco TL-6 (Hagglunds-like) vehicle. What's really impressive is that the venture had only this one prime mover! The 13-man group took did glaciology and gravity measurements along the way, actually a continuation of the multi-year ITASE project. It was a very talented group--the science leader Gino Casassa had climbed Everest. Two men flew out from Pole; the rest of the group left about a week later after some repairs. They arrived back at PH on 31 December (photos by IceCube team member Brian Pechan). 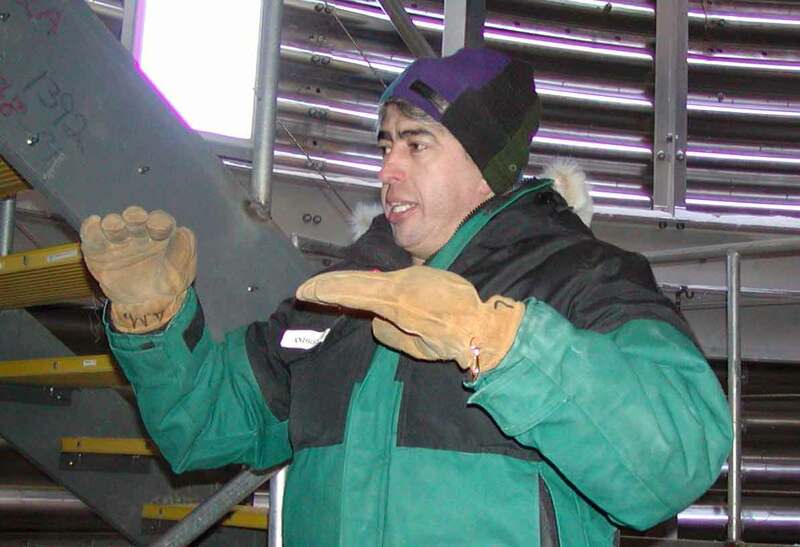 During the 2005 winter the Spanish Club (John Gallagher, Kelly Kozdras, Kirk Roberts, and Dan Simon --the instructor was James Sciarrino), translated the Chilean report on the expedition (which had been presented only in Spanish at the 2005 Stockholm Antarctic Treaty meeting). Here's what they came up with. Russian team arrives to repair and fly out in that Antonov-3T. 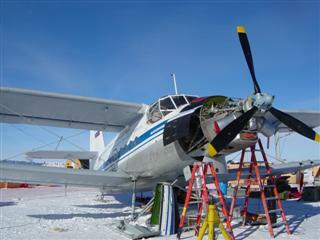 The aircraft had been parked on the berm since it had arrived in January 2002 and the engine couldn't be started. The provision of help may have had something to do with the charter of the Russian icebreaker Krasin that was arranged about the same time. Here's the rest of the story. 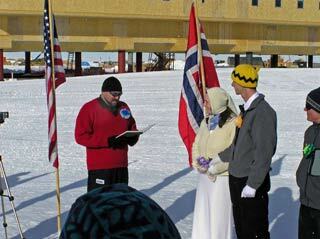 Third (known) marriage ceremony performed with great fanfare (1/16). 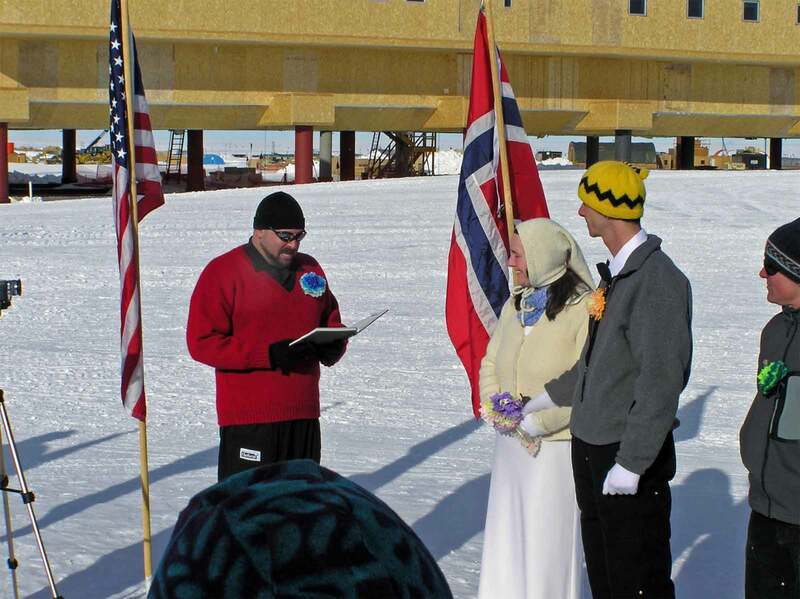 The principal characters were baker Erica Fickelsen and equipment operator John Johnstone, this ceremony was conducted by Cookie Jon (left, reading) in front of the new station. It happened a couple weeks before I showed up, but I thought that the leftover "Wedding in Progress" sign, which had been hung inside the beer can exit door, was a neat touch. This photo is from one of the w/o cooks, Eric Duncan. Oh, when were the first weddings? 1985 (wife Patty Chambers died in June 2011) and 1986. The latter couple is still happily married, as (I hope) are Erica and John. 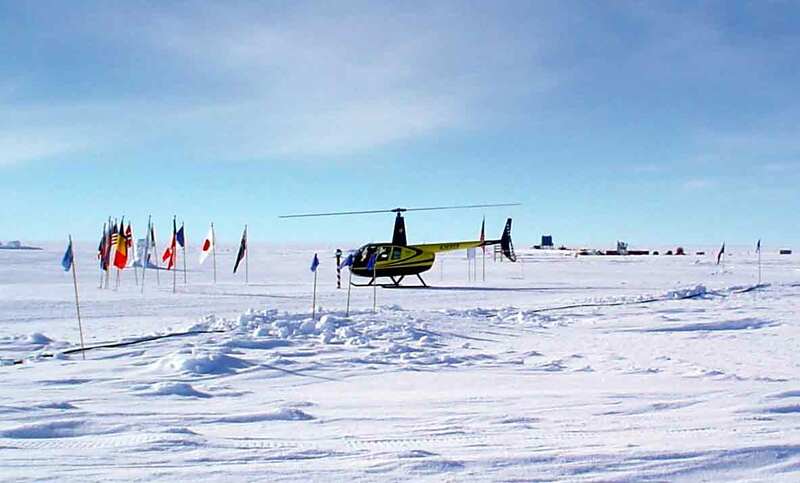 Robinson R44 Raven II helicopter lands at Pole (1/18) after flight from King George Island. Starting in Ushuaia, Brits Quentin Smith and Steve Brooks (photo) flew from the Argentine station Jubany to PH, and then to Pole using AL&E fuel caches (range of the R44 with an auxiliary tank is less than 550 miles]. 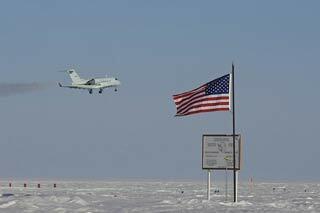 They landed 5 miles from Pole and camped overnight awaiting landing clearance (press release). They flew back to PH; the helo was then returned to PA aboard an AL&E operated Ilyushin IL-76. They'd crashed another helicopter 480 miles south of Cape Horn on a previous attempt on 27 January 2003 (Daily Mail article). On that trip, Steve rang up his wife on his satphone after ditching, asking her to alert the authorities. These photos are from Robinson Helicopter. New Cat 3406 "peaking generator" commissioned in the power plant--this unit, site rated at 229 KW, comes on automatically as load demand increases. Water supply line installed between the rodwell and summer camp. Old rodwell modules moved to the berms, perhaps for retrograde. 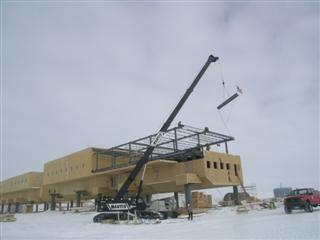 A4 and B4, the final 2 wings of the new elevated station, are successfully enclosed. At left, the last steel was erected on wing B4 on 19 January, this completes the steel erection for the new elevated station. 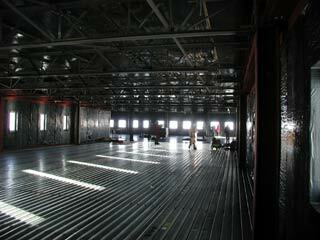 Wing B4 includes the gym and exercise areas; wing A4 (just to the right of the crane boom) was enclosed earlier in January. A4 contains 66 more summer berthing (and winter beer and soda storage :) rooms. ...as conditional occupancy is granted (30 January) for wings B1 and B2. 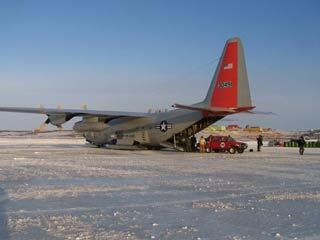 Last USAF C-141 Starlifter flight to McMurdo (4 February). The Air Force was retiring these aircraft; they were being supplanted by the C-17's. 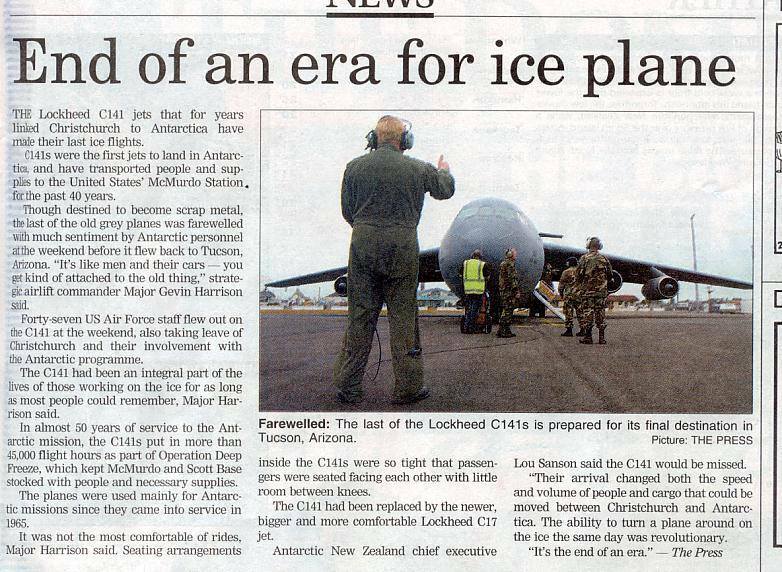 I had flown to McMurdo on the same aircraft a week earlier (Christchurch Press article). 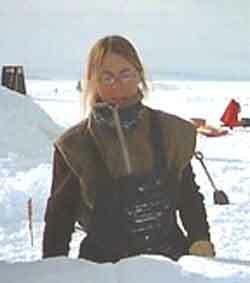 Manager: Bill Henriksen; population 86 (list and photos)--yet another record, and our group includes 24 women. 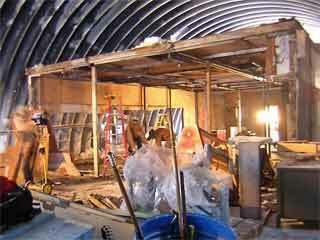 Construction continued at a fast pace after station closing...as well as the next phase of demolition (2/21) as the bar is closed. Three days before this picture was taken I was sharing a couple of cold ones here...the last of many since 1976. The old galley/bar structure is the first of the main station buildings to disappear (well, since BIT bit the dust in 1996-97). 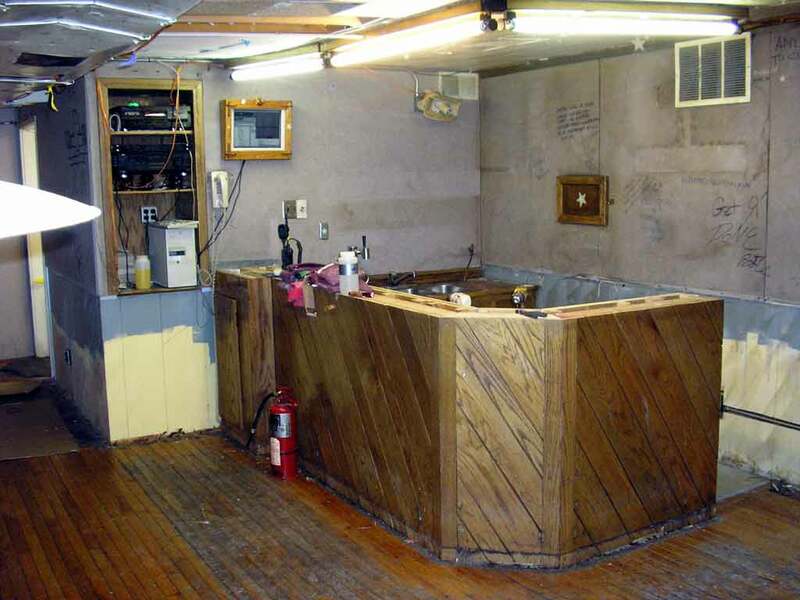 This is one of several structures (along with the dome itself) to be carefully dismantled for future display by the Seabee Museum folks...by the way, this bar was originally constructed by Eric Merriam with help from his fellow 1987 w/o team. 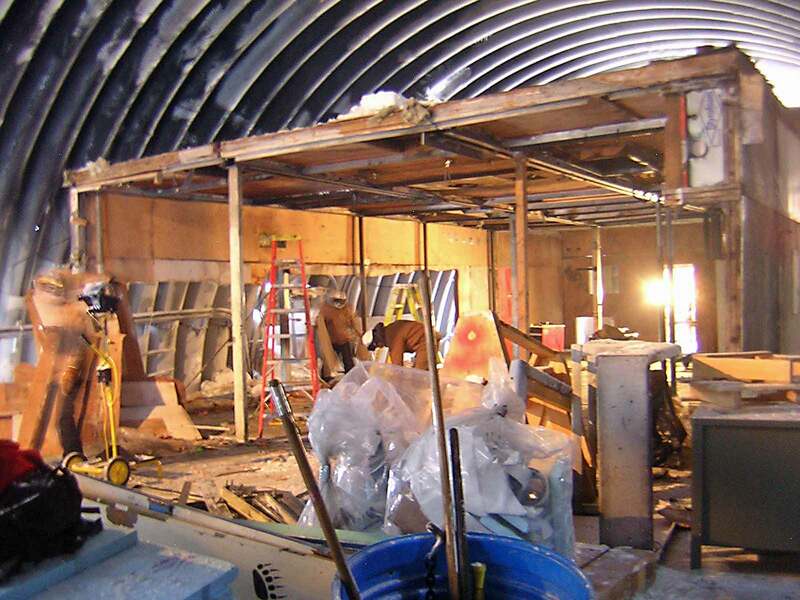 The galley is followed by the dome greenhouse and fire shack. Here you don't see the fire shack or the greenhouse... they're gone. The fire shack was hauled out in one piece after the roof was removed. Biomed is the next to go. By the end of April, the Biomed arch was empty except for the small electrical and comms substations...and a bit of associated comms wiring. Much of the storage area was relocated to the former galley site in the dome, as can be seen in our winterover picture. 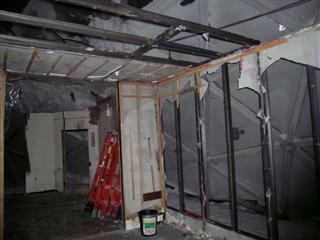 Here are the biomed demolition photos. Construction continued on the last 3 wings--B3, B4 and A4. and for the first time the liquid helium supply did NOT run out during the winter. The instrument would not be shipped north until 2006-07. At left, the abandoned AST/RO building in April 2006 (Brien Barnett, Antarctic Photo Library). 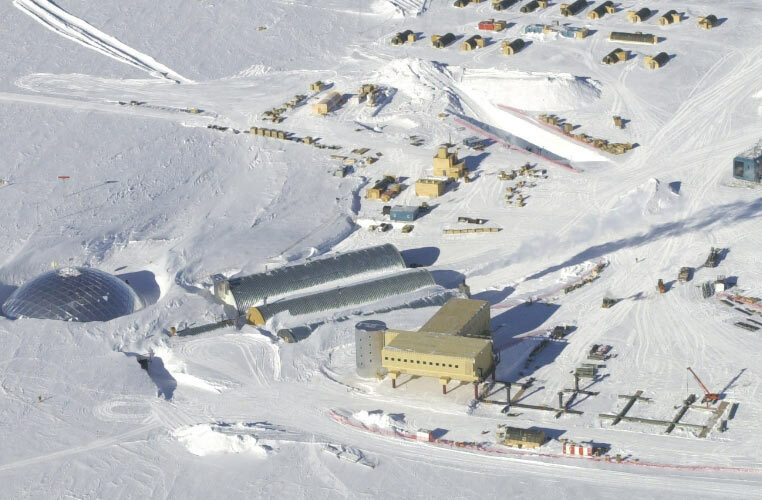 The building was the first science structure to be erected in the dark sector, construction began in 1991-92, and the AST/RO project moved in in 1994-95. 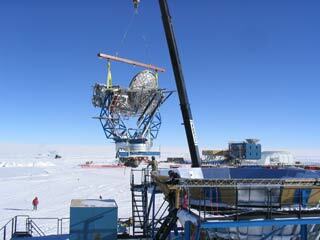 The project was an important predecessor to the South Pole Telescope. 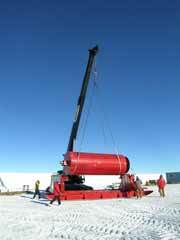 Here is a December 2005 Antarctic Sun article about the end of the project, it includes a photo of the instrument removal. Also of interest--an April 2006 Harvard Gazette article about the project, and a 2001 paper by principal investigator Tony Stark and others, both with photos. Science and musical instruments moved out of skylab into the elevated station. The first month of summer saw the CUSP, cosray and aurora lab stuff moved out of skylab into the B3 science lab and ARO (well, the cosray lab wasn't really moved since the long-running Bartol project wasn't funded; the cosmic ray detectors/neutron monitors were shut down on 22 November). 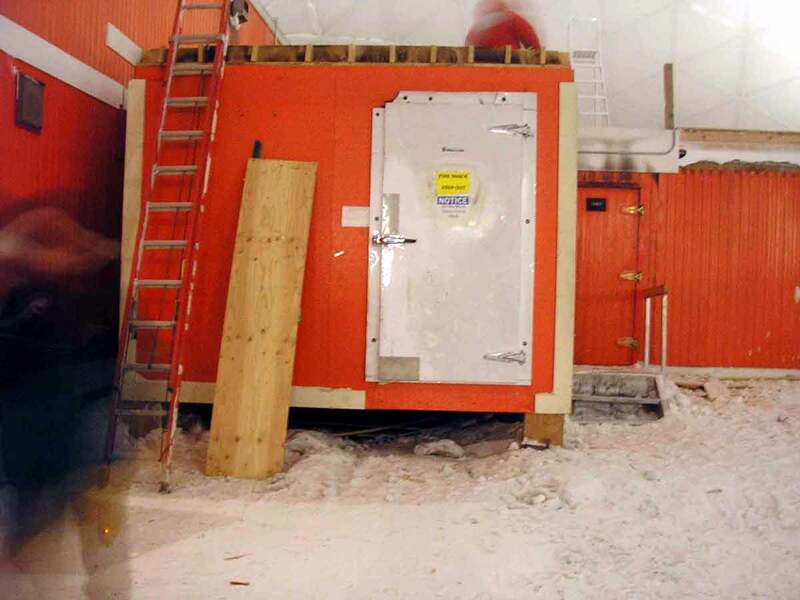 This usap.gov report by Peter Rejcek describes the relocation of the science projects; the photo at left by Liesl Schernthanner is titled "skylab roof closed 112905" as documented by the sign. This was only a week after my departure from Pole, marked for the last time by my traditional toast to the memory of Gary Rosenberger as I watched my outgoing flight land from this vantage point. DSL penthouse removed to clear the way for the BICEP telescope on the second floor. 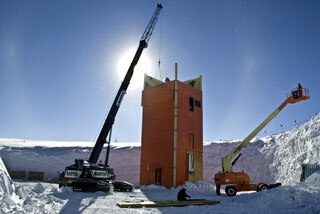 ...and the erection of the steel foundation for the new SPT (10-meter telescope), and its operations building. 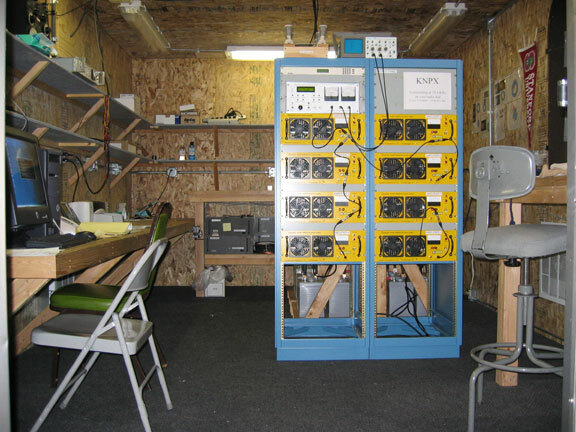 Stanford VLF beacon transmitter equipment for the 5-mile antenna retrograded after antenna lead-in and transmitter failure 2002-03 project installation information). 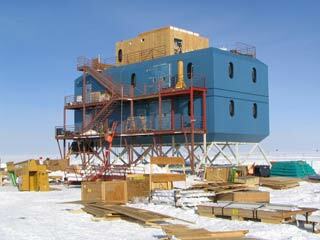 Work proceeds on the new IceCube Laboratory. This is the moved and converted Elevated Dorm at the end of summer; the tower is one of two to provide cable entry into the second floor data area. Winter work was scheduled to provide for December 2006 conditional occupancy (more info and photos). Commissioning of the SOC (station operations center, the new "COMMS" in B3) proceeds with the first digital HF radio transmission (28 November) using the new radio system and antennas. Installation of the gun-metal grey siding begun on the north face of the station. Cargo office and DNF dug out and relocated closer to the flight line. The old place near the garage was starting to get more subject to drifting; the new location was put on a berm and is much closer to the flight deck. While this was going on, the cargo offices were temporarily moved into one of the soon-to-be-demo'd buildings in the dome. 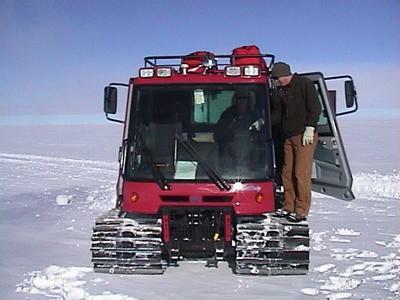 This photo by Scot Jackson appeared in the 11 December 2005 issue of the Antarctic Sun. Summer NGA visitors include a British/Icelandic team driving a Ford E-series van. The 6-man team made the trip from Patriot Hills in only 69 hours in this heavily customized 6x6 vehicle, which had been flown to PH. After a campout at Pole, they drove back up north; the vehicle has now been shipped back to the UK (more photos, information), and link to the trip log). 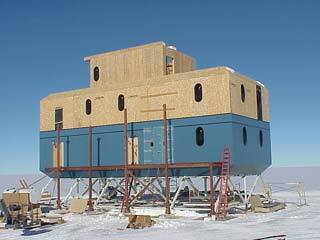 New cryogenics building put together. 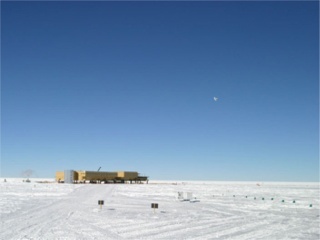 Cryo was assembled in three sections, the left and right thirds were standalone modules built in 2004-05, the center portion was erected between them after the site (next to the balloon inflation facility, BIF, to the right) was raised and prepared (photo from Jay Bollinger). The large dewars used to transport liquid helium from outside are to be stored in the left section. Here is a marked-up aerial shot of the facility (NSF USAP photo); more photos are here. For the second year in a row it looked like the LHe will last all winter! Conditional occupancy received for the last 3 wings of the elevated station (A4, B3 and B4) along with DSL and BICEP facilities. Winter construction included interior work on the SPT annex to DSL, the IceCube laboratory, counting house or whatever....cryo....and last but not least, the permanent gym floor was put down at the end of the winter. At left, Robert Schwarz, Craig Bell, and Denis Barkats enjoy some ball on the new gym floor. The lines on the floor wouldn't happen until later...and the temporary door in the background wouldn't go away for another year. 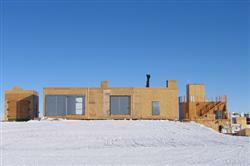 A page of photos of the winter construction is here. Ductwork is installed in the power plant to provide outside air intakes to the engines...cooling them and increasing efficiency by 0.5 KWH per gallon of fuel...to about 14.6 KWH/gallon. here's the next step. Beginning in late March, the Annex was made to go away as seen here in this pic from John Neame (which I lightened up a bit, here's the original view. After this structure was gone, everything else went cold. Here are more photos. 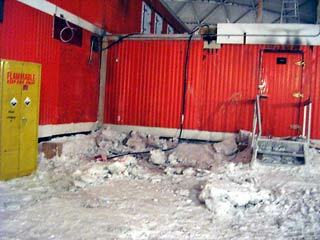 Some gutting was done in science/upper berthing as well. ...and comms is history except for the foundation. In this 2006-07 summer photo, the foundation of comms has been retained as a storage platform (and the science building in the background has been gutted). (more info/photos about the comms demo...and that surprise time capsule). 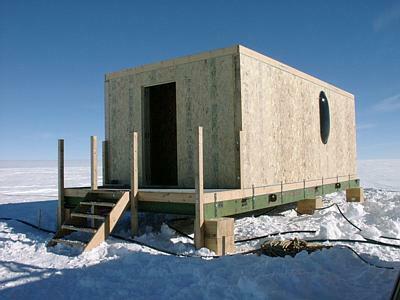 The IceCube lab gets conditional occupancy (12/8) and stuff is moved in. 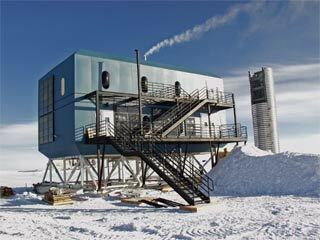 Heavy construction continues on the South Pole Telescope (SPT) and its building. Cryo is done, officially completely occupied. Airdrop...after several years of discussion, a proof-of-concept airdrop happens. The Air Force folks from McChord who fly the C-17's into McMurdo did this drop of 4 pallets, 70,000 lbs of...flour and similar dry food. Well, it was a test...(more information). Satcom upgrade of Pole and White Sands, NM earth stations provides massive bandwidth boost from 5 to ~60 Mbps, well above the target 45 Mbps--good news for IceCube and SPT that will soak much of that additional bandwidth. 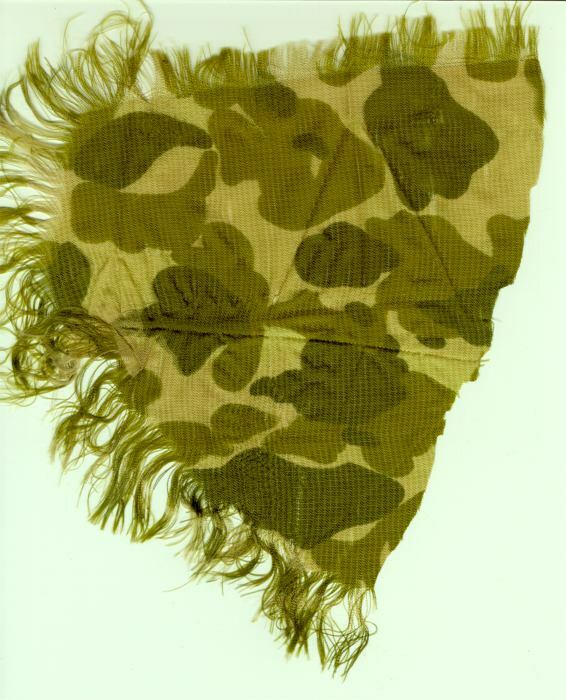 The first NGA parachute jump in a few years happened (15 December). Shital (Sheetal) Mahajan, a 24-year-old from Pune, India (about 50 miles inland from Mumbai) did a "free-fall accelerated jump" from at least 10,000 feet (above ground level, obviously :). She was assisted by 2 instructors before she pulled the ripcord at 4000 feet. Two items of interest...previously in 2004 she jumped at the North Pole...her very first jump after her very first aircraft flights. 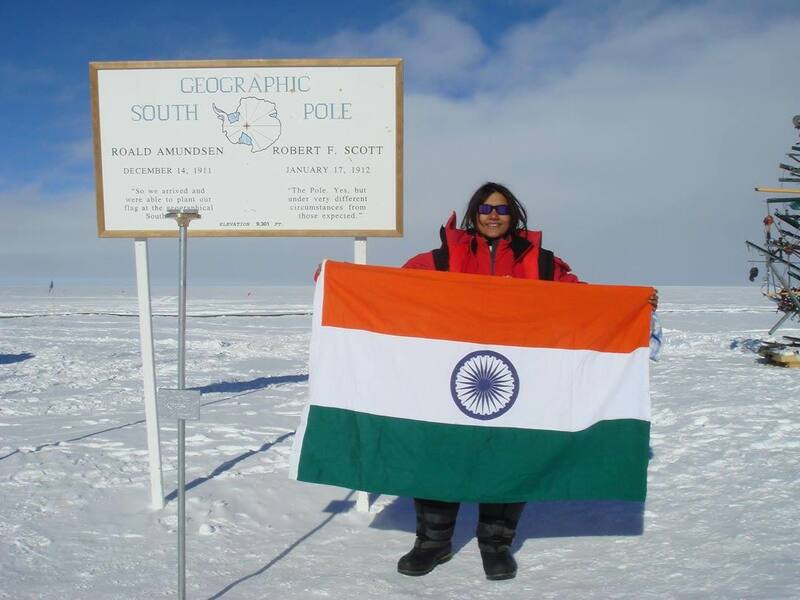 And...it seems that the two Indian Navy skydiving team members who assisted her have been accused of fraud in January 2009. Here's another news article, a photo source is this page. Skydiving at Pole is risky business. Rodwell #3 is drilled; originally it was to be conditioned until 2007-08 before placing into service. Two 25,000 gallon fuel bladders are installed to ensure enough winter heat and power--one inside the Biomed arch, and one on the surface above it. 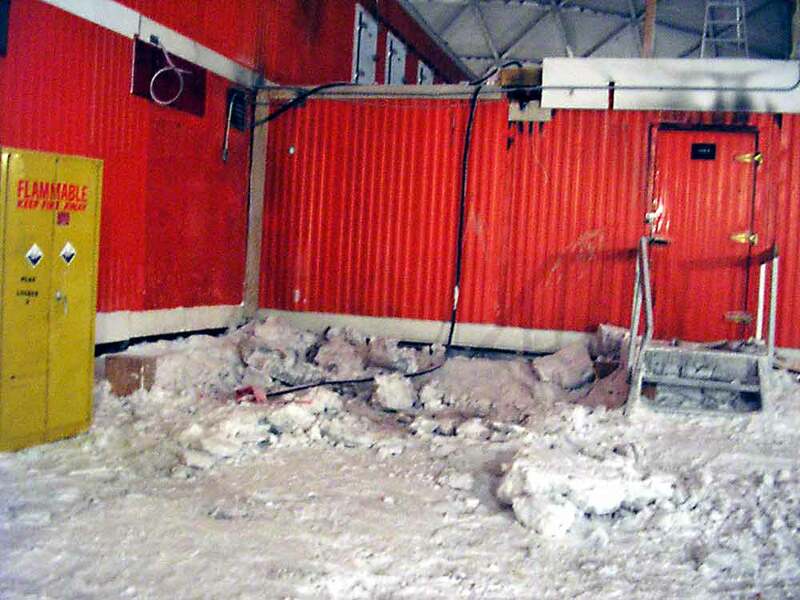 Major glycol spill in the power plant (26 December) puts the place out of commission for many hours and causes significant damage. The plumbers had to do maintenance on the waste heat recovery system for engine #3 (which was online), and although the valves were closed using DDC, one of them wasn't fully shut. But as there was no glycol circulation, it overheated...and before long a joint blew out and there was a massive glycol spill on top of the hot engine... which of course created noxious fumes. Fortunately no one was seriously hurt, but there was lots of cleanup and repair work required. Here's the story. VIPER telescope removed, shipped north. At the time, plans were to ship it to Berkeley where the parts would be used for another telescope. But the instrument actually sat at Port Hueneme for several years, before Allan Weatherwax, Siena College (near Albany NY) physics professor and Dean of Science (and a Pole researcher since the 1990's) came up with a project to have the telescope would be set up at Siena College (more information and photos). There were actually a total of 4 helicopters that showed up--two were Russian MI-8 helicopters (one of which is seen at left, surrounded by Polies); the other two were Bell 407 helicopters, one of which was piloted by Jennifer Murray and Colin Bodill (more information and photos). SPASE-2 project is shut down. 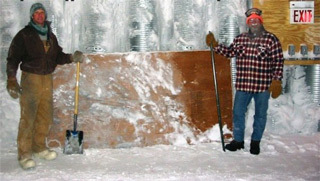 Most recently this effort had been operated by the UW IceCube folks (the Bartol website). The power plant is gutted...and the old garage/carp shop/gym/interim bar (or whatever) is made to go away. At left is an in-progress photo of the power plant disassembly...the actual demo of the building would have to wait for the summer arrival of an asbestos abatement team. The garage/carp shop building was totally removed...as documented here. 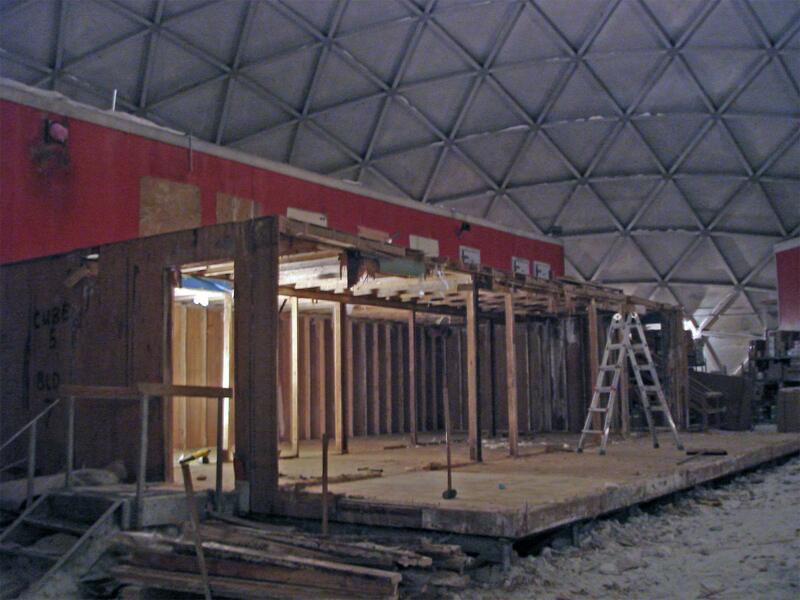 Dome demo concludes...with the demo of the science building and the comms foundation. ...began with the "soft opening"--a few Basler flights to move key people in and out. Oft talked about, but not done until this season. First things first...demoing the old arch power plant. The new cargo arch (well, logistics facility) construction gets underway with the removal of the dome entrance sign. 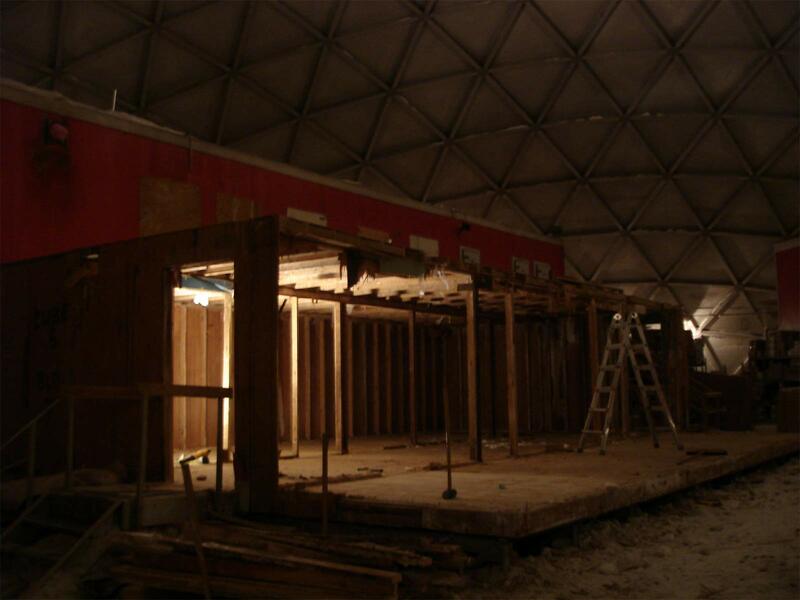 This is just the beginning of a major makeover of the domed station entrance--namely, making it go away (photo courtesy of Thorsten Stezelberger). Yes, there are many more photos here. Basler crashes upon takeoff from Mt. Paterson science site (78ºS-155ºW) (20 December) (no injuries). The aircraft, Kenn Borek's #C-FMKB, had difficulty taking off from a site near Mt. Paterson. It was picking up a POLENET research team that had been setting up seismic and GPS instrumentation at this and other sites (POLENET's Mt. Paterson information page). Four crew and 6 passengers were stranded for about 20 hours until two Twin Otters showed up for a rescue. Fortunately the weather was good. Two good blog posts with photos from folks who were there--one from Mitchell Barklage (source of the photo at left) and another from Don Voight. 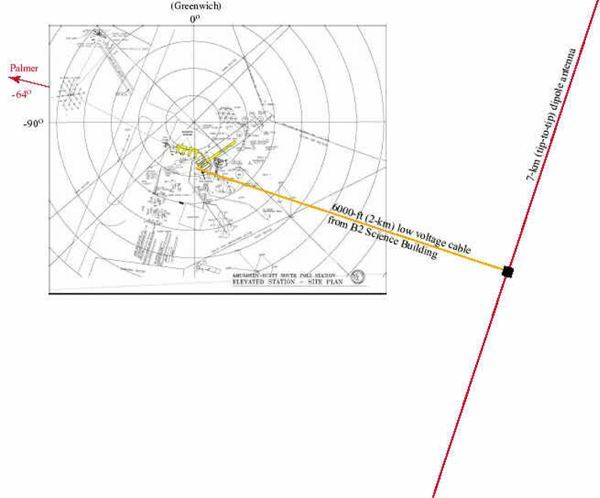 The NTSB issued this report, and NSF issued this press release. This archived Columbus Dispatch report misspells the site name--there is a Mount Patterson much further south. 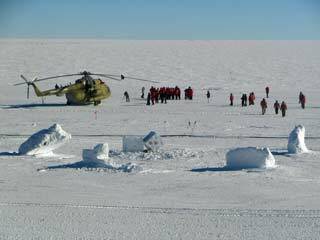 In 2008-09 a 12-person crew spent 25 days recovering the aircraft. Tail of the crashed 917 dug up to make way for skiway relocation. Christmas Eve fight at the summer camp smoking lounge results in a broken jaw and a medevac. It actually occurred at 0200 on Christmas Eve. 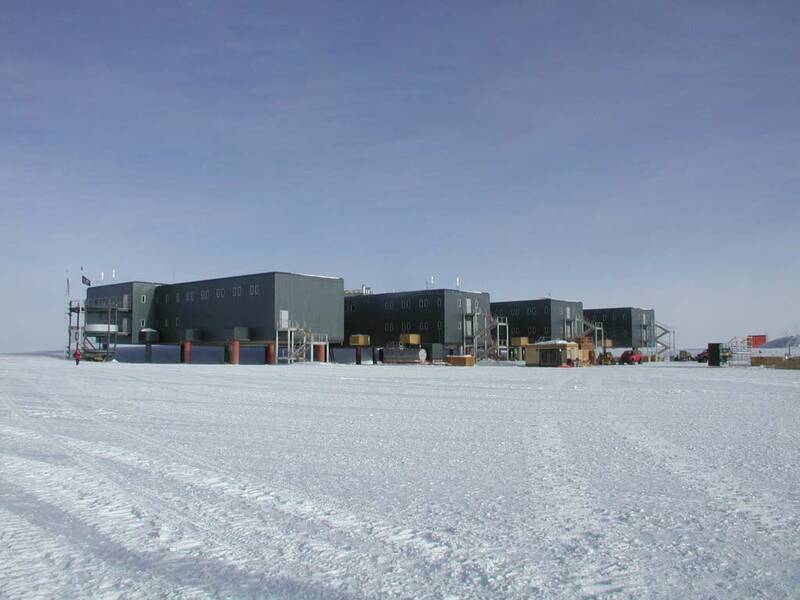 Here are two Christchurch Press articles that were updated in February 2009: "Man evacuated from Antarctica after drunken fight" and "Bad Santa mars ice celebration" (which mostly describes events at McMurdo). Unfortunately, the original article is no longer available. Also, here is 27 December 2007 Guardian coverage. Both of these guys got fired, needless to say, and we 2008 winterovers had to resolve some of the stuff they were working on and left unfinished. Construction of the new Logistics Facility (LO) continues. 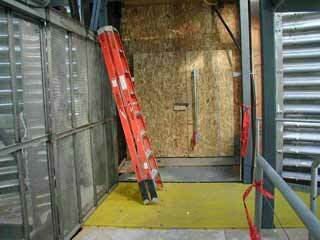 At left is my "before" photo of the level 1 door into the station from the beer can. 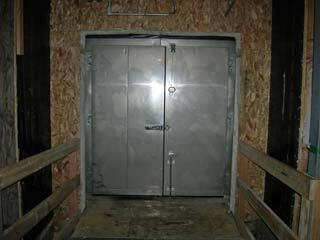 The door was supposed to be located in the main wall opening, but because pod A2 was settling more than the beer can stairwell in 2002, it was moved back a few feet as seen here--otherwise the doors wouldn't open because they would bind up on the floor. The stair and landing elevations were later lowered, so our task was to move these doors back to the design location (details and more photos). Unfortunately, the station has continued to settle more than the stairwell, so the stairs and landings now need to be lowered again, hopefully this (2013-14) summer. The SPMGT satellite dish elevation gear acts up again...this time maintenance is a bit easier as there are spare parts, the antenna is enclosed in a radome, and the critical areas can be heated a bit more easily. 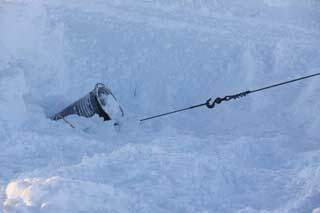 Repairs were successfully made in what was called a "MacGyver Solution" by VMF supervisor Jack Sharp, mechanic Jason McDonald, satcom engineer Pete Allen and others, as documented in this Antarctic Sun article. Jack showed me the gearbox in the VMF, it was a piece of work. The South Pole Telescope (SPT) group celebrates publication of their first paper. The event is an excuse for me to present one of many excellent photographs of the telescope that w/o Canadian cosmologist Keith Vanderlinde took during the winter, this one, of course, featuring the telescope. Keith, along with Dana Hrubes, were the two folks running the SPT this winter. The paper can be downloaded here. Dr. Martin A. Pomerantz dies (25 October). MARISAT-F2 satellite decommissioned (29 October). At left, a graphic by NSF's Pat Smith depicting the 3 satellites we had been using during my 2008 winter. The 32-year-old satellite was running out of maneuvering fuel, so it had to be moved to a "disposal altitude" away from other satellites...and Pole lost about 25% of its internet availability. 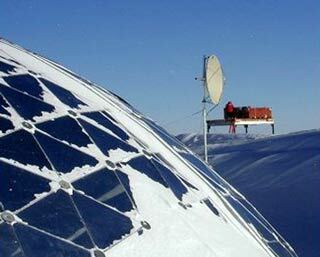 Unfortunately, in June 2010, TDRS-F1 would suffer a similar fate (Antarctic Sun article). The goal was to shift the active skiway south of the protruding bump created by the dark sector road...a multi-year project here being inspected by an FAA/Air Force inspection mission (more info and photos). Air Force NYANG conducts historic medevac from Davis. 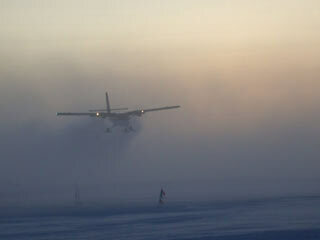 At left, the medevac LC-130 aircraft is parked on a temporary sea ice runway at the Australian base. It flew there from McMurdo on the evening of 4 November and then took injured cook Dwayne Rooke to Hobart a day later. In this photo Dwayne is being transported aboard the aircraft for the flight north. Here's the rest of the story, press releases and more photos. SPTR-2 platform, antenna and radome completed. This 8-meter radome houses an antenna that was designed to catch the next generation of old TDRSS satellites that pop above the horizon for short periods. 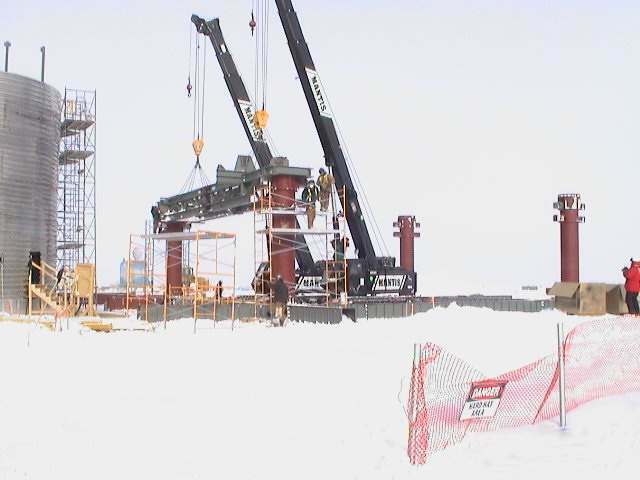 The FEMC construction and IT portions of the project were completed but its capability didn't get put into use until the end of the winter when TDRSS-1 died. Here are construction pics and an April 2009 Raytheon writeup from their Technology Today semiannual publication. Logistics facility building and decks finished. NOAA met tower raised back up to 100 feet (30m) with the addition of 5 new (and unpainted) scaffold sections (photos). Well, all but a few small details at least. It looks good in this view from near the pax terminal that Tom Hamann took on 2 February. What comes last is the top and the bottom, er, the roof and soffit. VLF beacon antenna reconstructed and put back on line. This 5 mile/7km antenna was originally installed in 2002-03; it extends along the west side of the dark sector until 2005 after it failed and was decommissioned, it was powered and monitored from the "Inan shack" west of DSL. 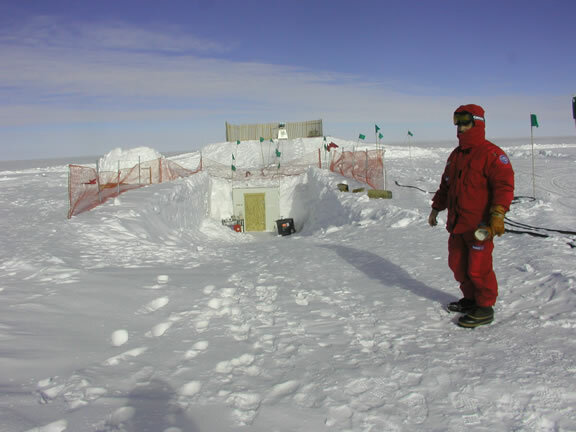 In 2008-09 the power and control room was moved to the former VIPER control room connected to MAPO, it was repaired (seen here is science tech Robert Fuhrmann working on it) and was back up and running, sending VLF transmissions detected at Palmer Station. Here's the Antarctic Sun article and photo source (photo by Mark Daniel); and here's a trip report by Stanford rep Robert Newsome with more details and photos. Note that Stanford had a separate low-power VLF receiver project located roughly east of ARO in the clean air sector. AASTO/SETI building removed and retrograded. 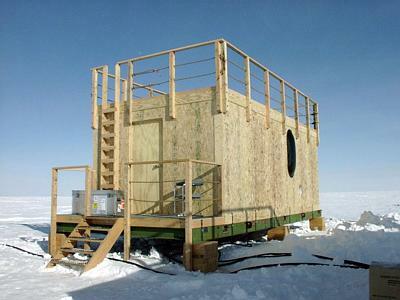 This hut spent most of its life in the dark sector as a testbed for the University of New South Wales (UNSW), measuring astronomical observing conditions for potential Antarctic Plateau observatories. 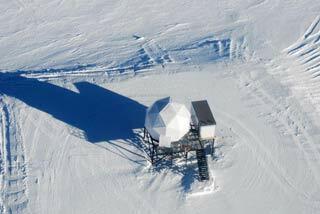 It was moved to its later location near ARO in 2003-04 for the NASA/SETI Institute project "Search for Extrasolar Planets from the South Pole," or "Vulcan South" (archived site). The telescope mount supported an optical telescope. This was one of the projects operated by Dana Hrubes. 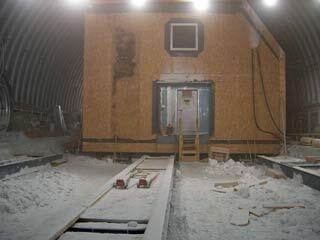 The telescope mount was stored on the berm; the hut was retro'd to McM for rehab and use elsewhere. The photos here are from carpenter Laura Conchelos. 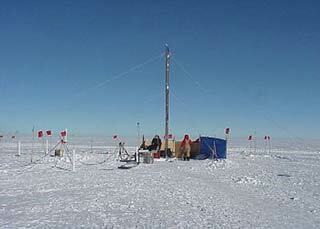 HSH Prince Albert II of Monaco (center, behind the Pole marker) visits Pole (14 January). 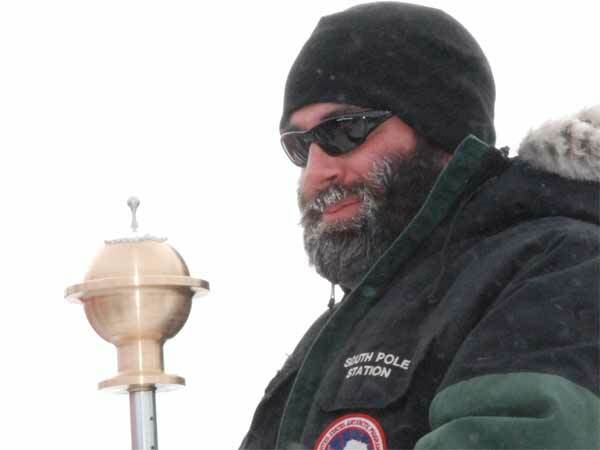 He was the first member of royalty to reach Pole--one of 26 Antarctic bases he visited on his month-long trip, which also included stops at Concordia and Vostok. After visiting KGI and flying to PH, he and his team of 8 flew from PH to 88º51'S-83º14'W on 12 January. where they met Børge Ousland, Clèmence Cadario, Nicolas Valdivieso, and Mike Horn (Mike's blog entry about the meetup). (Mike had been traveling solo from Hercules Inlet until Borge's party had flown in to meet him the day before the prince arrived). 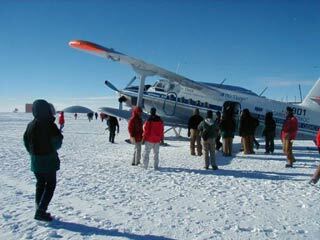 Everyone then skied 8 miles south; then they were flown to within 6 miles of the Pole, from where they completed their trek. 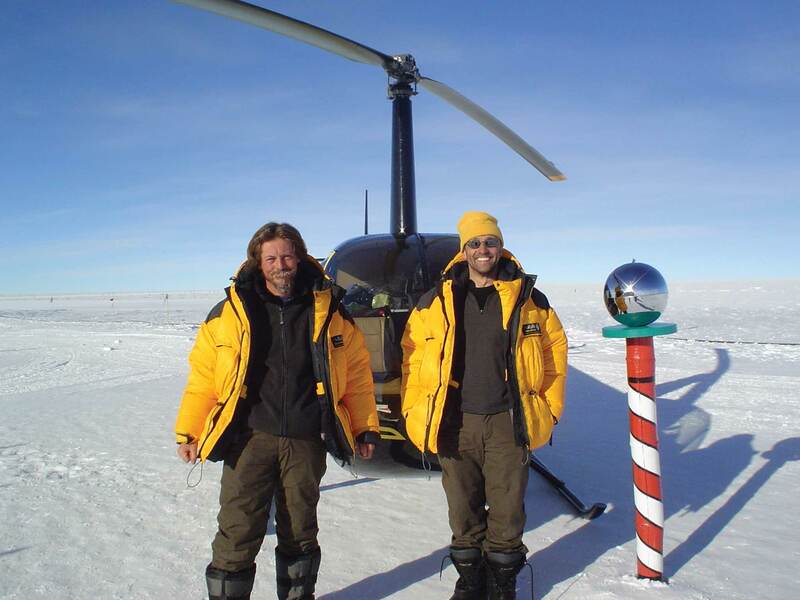 The prince's group then flew to McM; the others were flown back to their camp near 89ºS to complete their longer trek to Pole. Here's a news article about the trip from the Prince Albert II of Monaco Foundation; their trip page and daily log book (including the photo at left) are no longer online. Also, here's an Antarctic Sun photo, and Ella Derbyshire's Gigapan photo of the Pole arrival. 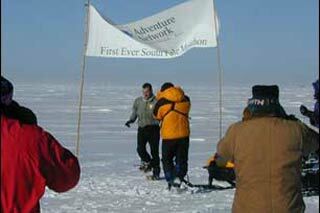 Earlier, the prince had completed a 4-day trek to the North Pole on 16 April 2006. 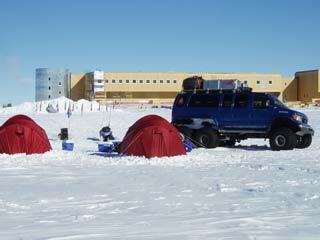 More Pole visitors--the Amundsen Omega3 South Pole Race...with Arctic Trucks support. 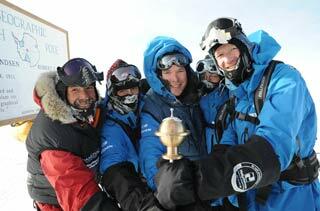 It was sponsored by Amundsen Omega 3 AS, then a Norwegian company selling fish oil omega-3 food and skin products. It was a ~494-mile ski sledging race in 2 equal legs from 83ºS (directly south of/supported from Novo) to Pole. Six 3-person teams entered, though only 5 finished officially. Most links have vanished, but here are information page and schedule archives. The actual race started on 5 January SP time; here's an old ExploraPoles news article published while the race was in progress. 17 days 11 hours later a Norwegian team won (BBC News article). This was Arctic Trucks' second Antarctic venture--at left, on 6 January two of their Toyotas encountered the Norwegian-American scientific traverse near the 83ºS race start (info). This was the first motorized trip from Novo to Pole; the Pole-Novo return trip (~2500 km) was completed in 8 days 17 hours (Arctic Trucks news page). 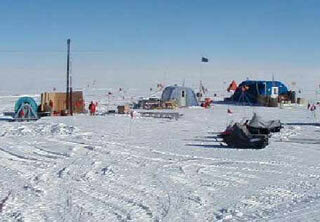 Also, here's a panoramic race camp photo of the Pole race camp by 2009 wo physician Ella Derbyshire. 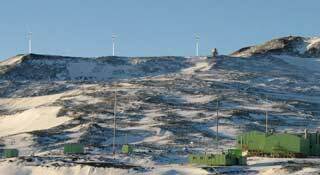 McMurdo "wind farm" construction underway. Yes, it was happening...the A1 roof you see here is done, and they've moved on to A4 which would most likely be complete before sunset, weather permitting as they say. Wind chills have already been in the -80's (°F) and those electrical cords have been stiffening up. Check out the pictures! 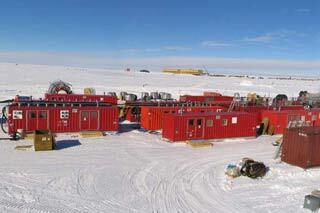 Bids were due on 23 February for the next Antarctic support contract. It was originally scheduled to be awarded in October 2009, but the award was put off for two years. Here's the shaft (an old extra piece of the dome emergency exit) getting yanked out...but things didn't go exactly as planned (details). 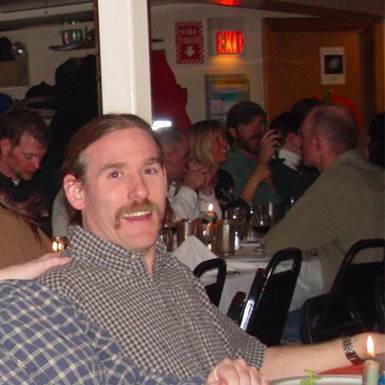 Jake, who wintered 5 consecutive times at Pole (2000-04) was last seen on Wednesday evening (15 April). While out checking the runway, a whiteout came up, his snowmobile ran out of fuel 3 miles from the station, and he had no radio. He survived in the -40°F temps by alternatively staying in a snow cave and moving about. On Saturday when he heard the search team, he walked up to their vehicle and calmly asked for a ride back to the station! 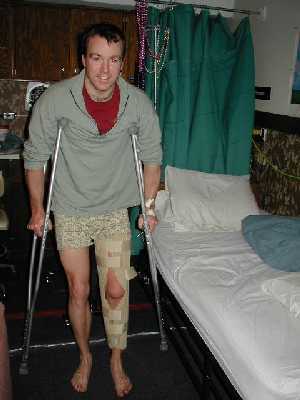 He was medevaced and eventually lost 3 limbs (the full story). LO (logistics) arch construction includes lighting and shelving (information and photos). 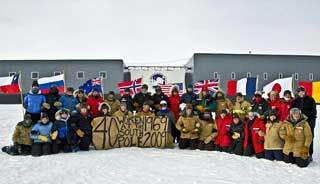 40th anniversary of the first women at Pole is celebrated. 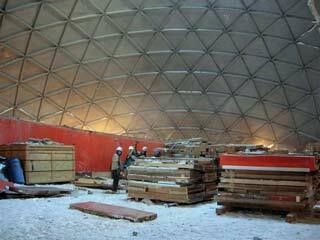 This was the first phase of the removal of the last above-snow features of the domed station, in early December. 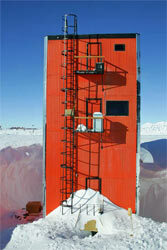 In about a week this red-orange Pole icon was history (more photos/info/credit). ...and the dome itself was the next target. 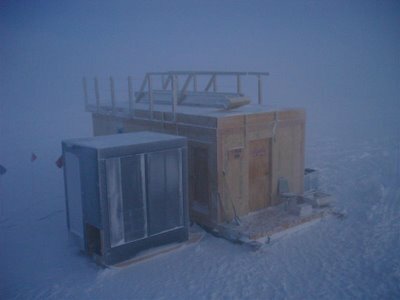 The night shift was working this little project, so this lift was made about 0400 on 18 December. This top section is part of what will go to the Seabee museum in Port Hueneme; the rest was originally to be stored to get shredded the next season after the shredder showed up (on vessel at the end of the summer). But the shredder never was put to use...the entire dome structure was removed in pieces and shipped back to Port Hueneme (more photos/info/credit). 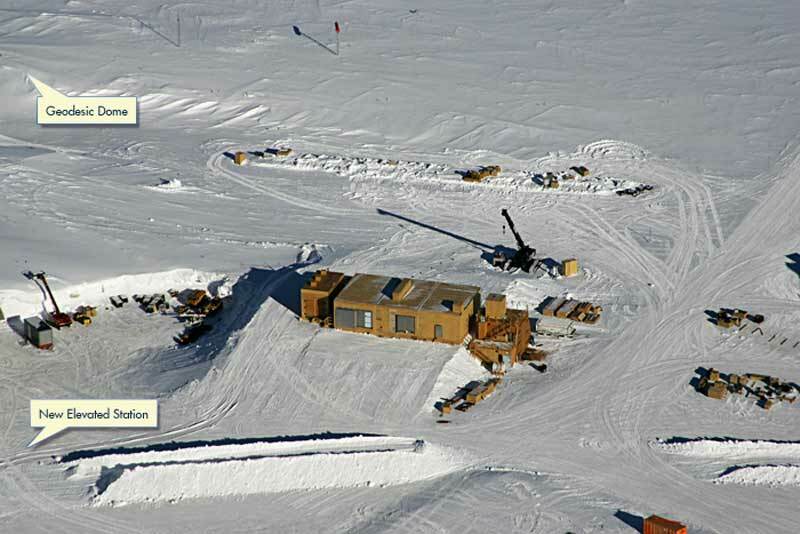 Former SPASE-2 platform and hut moved from the dark sector. 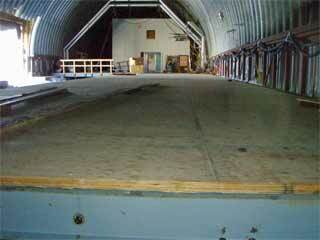 Since the SPASE-2 project was shut down in 2006-07 this shelter in the dark sector had gone unused. It was initially parked behind summer camp, as there were no immediate plans for its future use. In 2012-13 it was modified and expanded for use as the SuperDARN control building. Here's another view of the tow underway (these photos are from Jim Yeck). 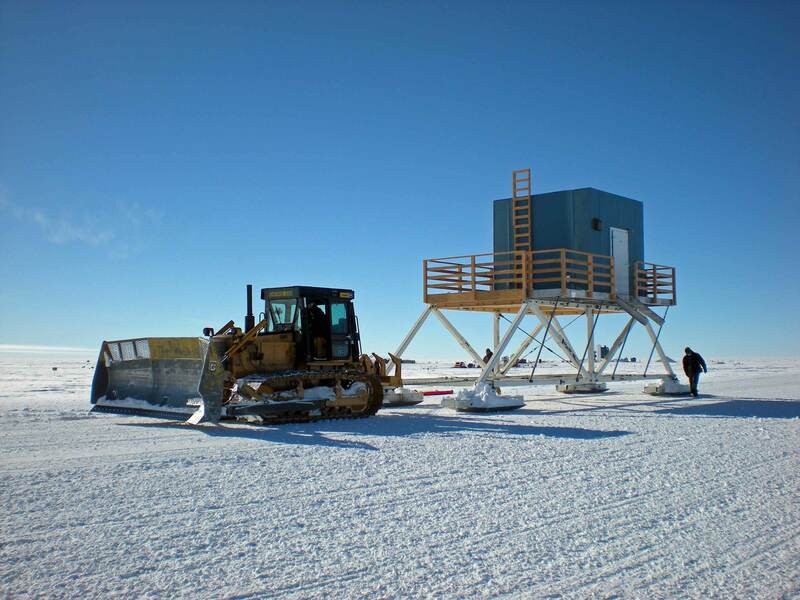 Cosray project funded again to Bartol/University of Delaware; detectors and platform moved in front of the station (photo from Ethan Good). 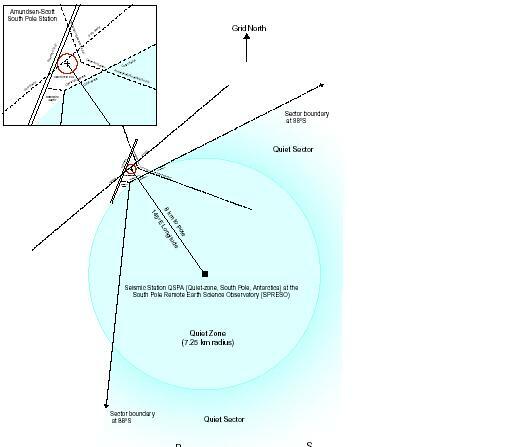 More work was done on the 5 mile Stanford VLF beacon transmitter and its antenna (earlier info). Here are trip reports by Stanford folks George Jin and Daniel Golden. 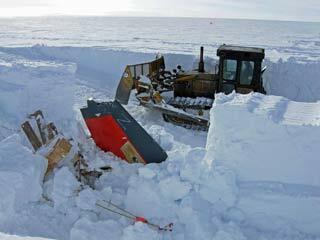 But their work was for naught; the beacon amplifiers and instrumentation were put into storage in 2010-11. The low-power receiver was to continue operation for another season. Alternative energy--wind turbine is erected behind the new rodwell, and solar panels are put on the roof of Altie Meadows. The wind turbine was a 2.5 KW unit quite similar to the machines used at the AGO sites. The turbine and the solar panels are now connected to the station power grid (more info and photos). 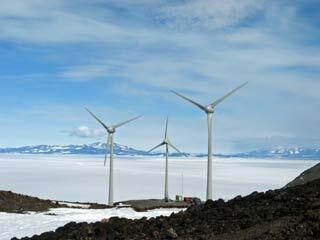 McMurdo wind farm completed and dedicated. Two NGO medevacs...a TAC employee was medevaced on a TAC aircraft after consultation with the station doctor; an ANI/ALE client was medevaced to McMurdo/New Zealand after similar consultations.